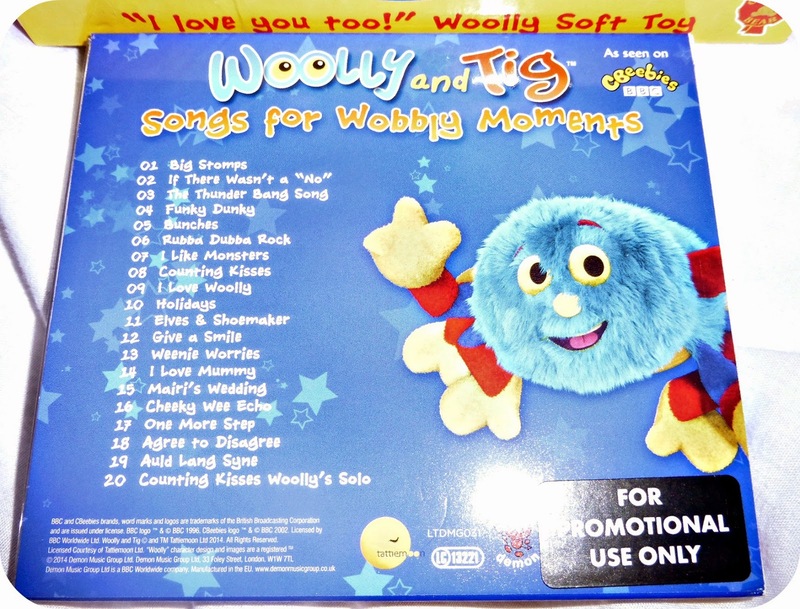 We were recently sent the new Woolly and Tig Songs forWobbly Moments CD to enjoy with Leo. Leo enjoys the short Woolly and Tig episodes and is really fond of Woolly himself, so I knew that this was going to be a hit with my 3 year old. 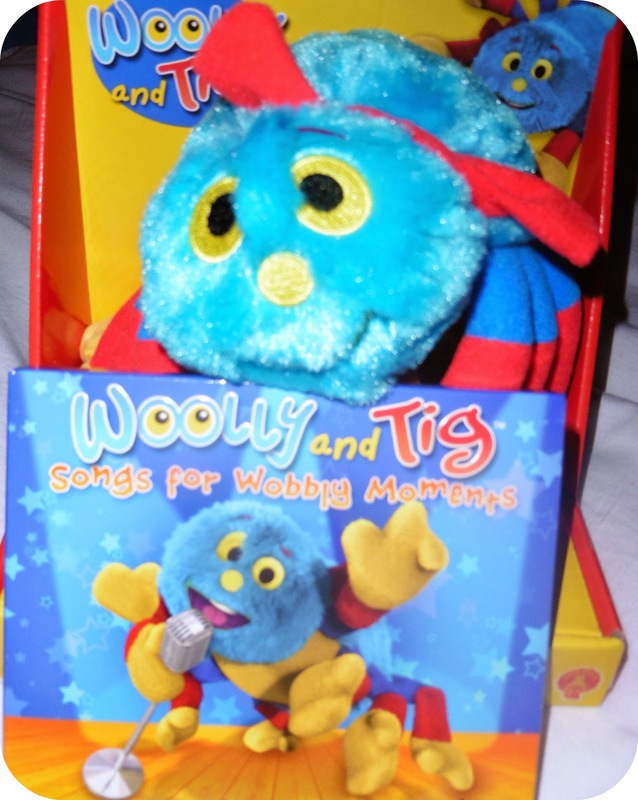 Woolley and Tig is a television show on Cbeebies that follows the adventures of a young girl named Tig, and her blue toy spider Woolly. Each episode follows the duo through everyday scenarios like making new friends or taking a trip to the dentist. Leo has been loving playing the CD on journey’s out in the car, and has even taken to playing it through the DVD player at home. Each of the songs are great for singing along too, in fact you will probably find yourself singing along before too long. The CD even comes with a little picture for little one’s to colour in and enjoy. It is the little touches like this that make this CD extra special. 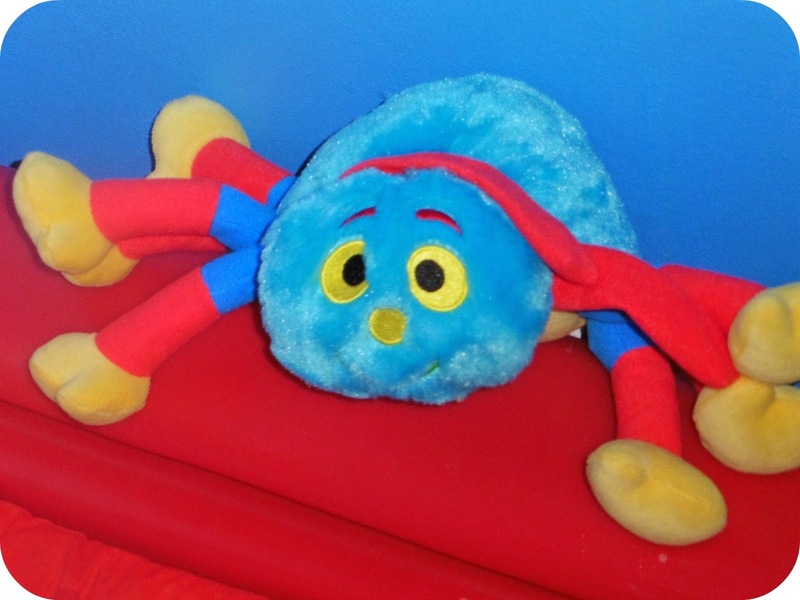 Leo was especially pleased as he was sent his very own Woolly toy along with this CD, and he has become a firm fixture in Leo’s bed, along with his other favourite plush toys. 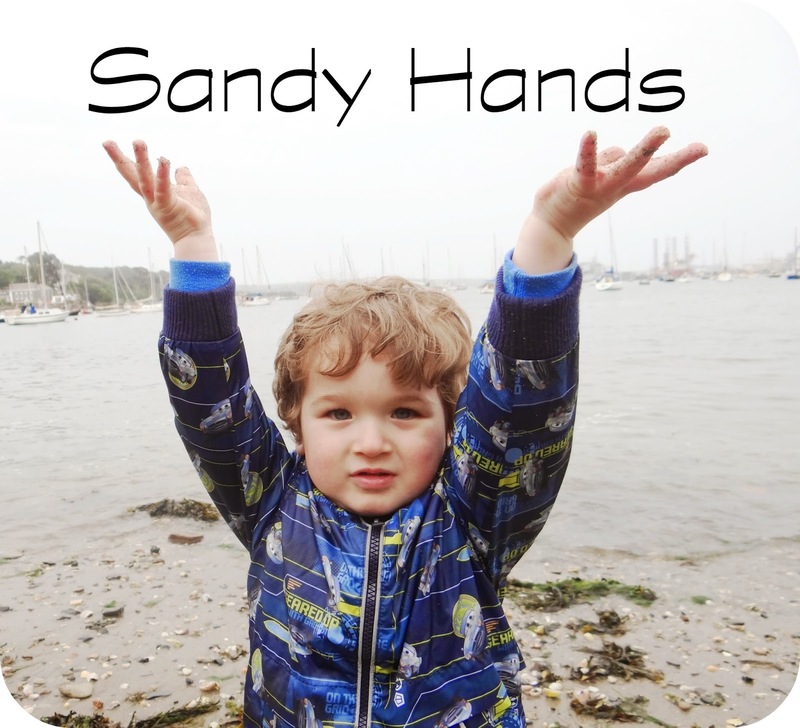 If your little one enjoys Woolly and Tig then definitely check out this CD, it is now a much loved addition to Leo’s growing music collection. Disclaimer: We were sent the above items for the purpose of this review. All views and opinions expressed are completely honest and my own. 3 years ago when Leo arrived into the world we found ourselves considering avenues we hadn't given much thought to before. 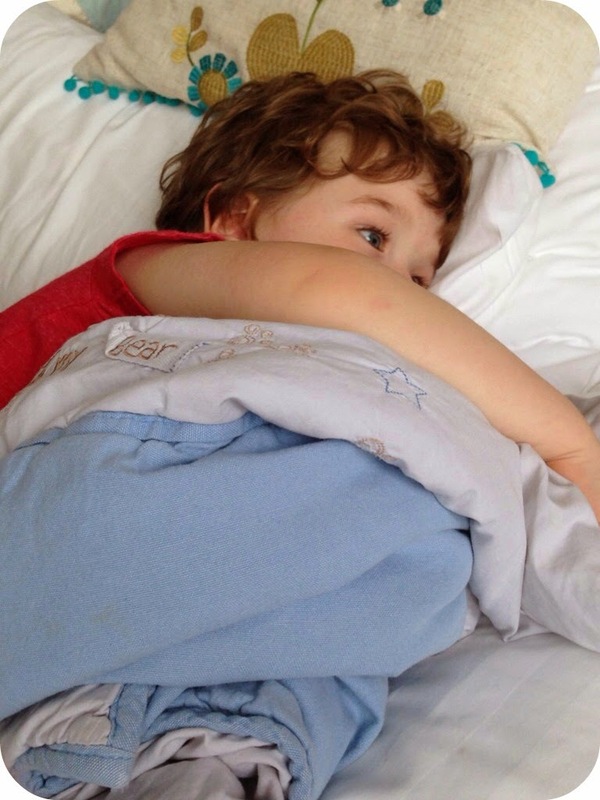 In those early days when friends and family were bestowing our beautiful boy with gifts and treats, we were inundated with a very generous sum of money for Leo. 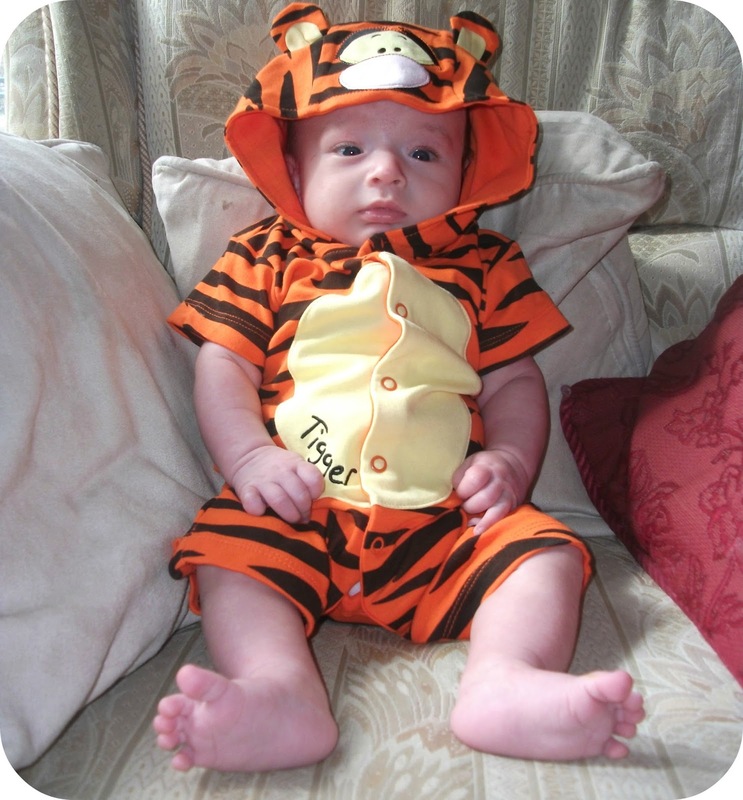 We soon realised that we needed to look into the practical solution of a savings account for our newborn. We recruited help from Leo's Granddad who has always been our go to man for financial advice, and he highly recommended that we take a look at an ISA. 3 years later Leo's money is safely tucked away for Leo until he comes to an age where he can use it for his future. Now the chancellor has made an announcement in his recent budget speech in regards to changes to ISAs. From the 1st July 2014 ISAs will be reformed into a much simpler product, NISA. We need not worry as all existing ISAs will be automatically converted to the new ISA. This means that Leo's ISA will be benefiting from the new changes. But what are the changes? From 1 July 2014 the overall subscription limit set by the Government for 2014/15 will increase from £11,880 to £15,000. It will be possible for new subscriptions to be split in any proportion between a New Cash ISA and New Stocks and Shares ISA - currently, investments into a Cash ISA are limited to a maximum of £5,940. Therefore, the investor will have more choice on where to put their money; invest it all in a New Cash ISA, split it however you want between a New Cash ISA and New Stocks and Shares ISA or invest the full subscription amount in a New Stocks and Shares ISA. What happens to contributions made from 6 April this tax year? Any contributions made into an ISA from 6 April this tax year will count against your New ISA limit for 2014/15. If you already have an Cash or Stocks and Shares ISA, you won't be able to open a New ISA of the same type from 1 July. Instead, your existing ISA will turn into a New ISA and your annual limit will automatically increase to £15,000. Currently, you can transfer a Cash ISA into another Cash ISA or move it to a Stocks and Shares ISA. New ISAs will still allow you to do just that. However, with an existing Stocks and Shares ISA, you can only transfer it into another Stocks and Shares ISA. However, from 1 July 2014, the New ISA will also enable you to transfer your savings from New Stocks and Shares ISAs to New Cash ISAs as you wish. If you want to switch an ISA to Scottish Friendly, My Choice (ISA) accepts ISA transfers. From 1 July this will automatically convert into a New ISA meaning your allowance will increase to £15,000. For all of the information on the New ISA, Scottish Friendly have put together a informative guide. You will also see a very helpful video below on the new ISA just have a watch of this short clip as it explains everything in a easy to follow format (using everyday words!). What I love about saving Leo's money for his future, is that he is going to have the money readily available to him when he comes of age. It may help him buy his very first car or even put a deposit down on his very first home. The day will come when Leo is very thankful that we saved up all of those pennies for him, when he is all grown up and taking the world by storm. 3 years ago today we stepped onto a rollercoaster that has ploughed us through the last couple of years. With each loop de loop we have flashed through many months all in one go, those months have turned into years and with each twist and turn we have continued to rocket through the atmosphere at an incredible pace. At least that’s exactly how it feels. In reality we have been living our lives day to day and making memories together. I have seen you blossom before my very eyes and you are now a bright, happy little boy. All of a sudden these changes have happened, and yet again I am left wondering where the time has gone. I have seen you lose all of that puppy fat, and watched you shoot right up. You now look like a little boy, and at 3 years old that is exactly what you now are. A little boy ready to take on the world. At 3 years old your favourite story book is The Three Little Pigs, although the very first time you heard it you told me how the wolf scared you. These days you anticipate how the wolf will huff and puff in order to eat the Three Little Pigs. At 3 years old your speech is coming on all of the time, and just last night you were so excited about your birthday today and you informed me that you would like a baby crocodile! This truly is the first year that you have grasped the fact that something exciting was about to happen. You were so excited that even when I got you to bed to read you your story, you hopped back up again when you heard Auntie Alice returning home. You got up and said 'Want to see Aiya! ', because even though you can say Alice as clear as day these days, Aiya has kind of stuck around as her nick name. You ran down the stairs with your bear book, you wanted to show her how you could count the trains, boats and bikes on the inside of the book. You did just that and you counted the 4 bikes and the 3 trains all the while looking increasingly proud of yourself. In the year since you turned 2 we have both come so far, we have made changes and moved forward with our lives. We have laughed, we have smiled and we have made some incredible memories. At 2 years old you took on your very first rollercoaster and loved it so much we had to do it again and again. It has seen us take on potty training and succeed! By 3 you were dry during the day, and this was such a fantastic achievement. It has seen you giving up your bottle and still absolutely adoring your blanket. 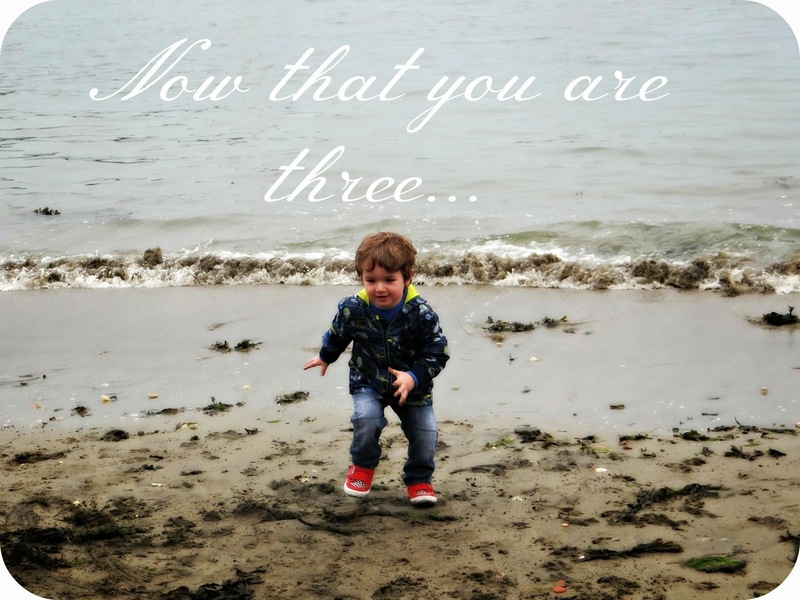 Turning 3 is such a big milestone, those baby days are so far behind us now that it feels like it was a lifetime ago. Those toddler days are now fading away in the rear view mirror, and you are now officially a little boy. 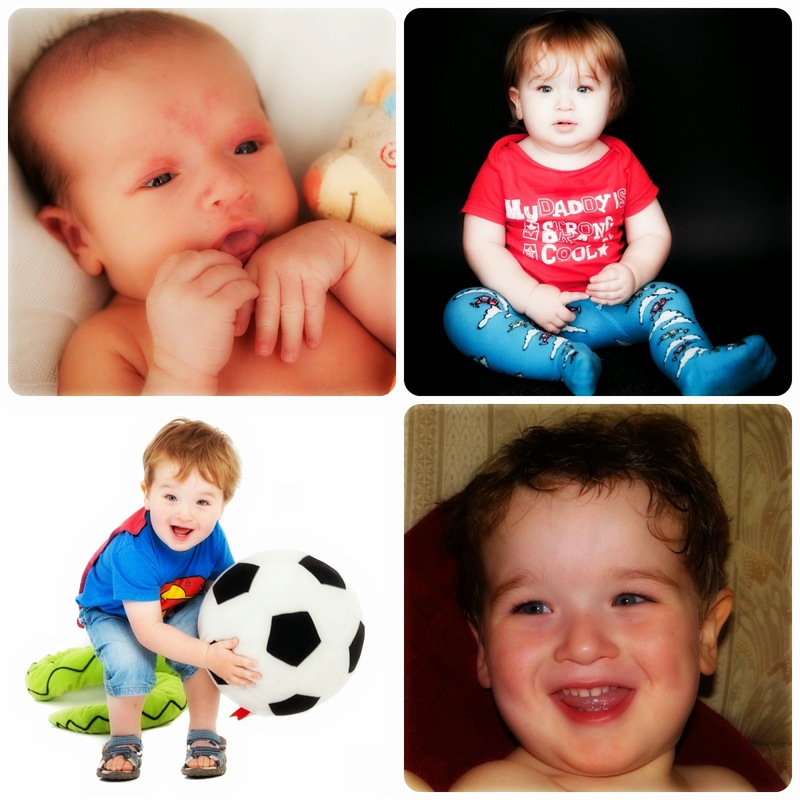 A little boy who this time next year will be turning four and starting school in the September. It is all absolutely crazy but it's happening. Happy birthday beautiful boy. I hope you have a truly fantastic day and that your excitement transcends into the most amazing day for you. This years birthday theme is of course Cars, so keep your eyes peeled for that much coveted Lightning McQueen Cake! As I got older my life aspirations changed, and by the time I was around the age of 10 I was adamant that I was going to become a vet. This seemed like a much more realistic option until I heard how I would have to maybe insert my hands places that I didn't really want to insert them... This very quickly changed my mind and my princess idea seemed much more attractive. During my later school days I decided I would like to be a journalist, I loved to write and this seemed like a fantastic idea. To this day I don't know why I didn't pursue this more, as looking back it still seems like a desirable career choice. Right now though I am still trying to find my dream job, I have ideas and in the perfect world I would be working from home. I would be heading up social media channels and outreaching to blogs. I would be handing my notice in at work and doing something that I am passionate about... But for the moment that isn't going to happen. Over the last year I have been scouring the internet looking for that one job that could give me the break I long for. I have read job description after job description, and hoped that the next one would be the one for me. Due to me location within the UK there aren't really many fees-able opportunities for me to consider, everything requires travel and usual to London. I have been having a look at the positions available on City Calling. You simply have to enter the job position you are looking for, and it will bring up a search result of everything that matches that criteria. I may not have found my dream position just yet but I do however have a meeting with a local company this Thursday to discuss their social media requirements. They are currently non existent online, and they may be looking for my services. I am truly excited to attend this meeting and think it will be great work experience for my CV, who know this could be the break I am looking for! Everyone knows the classic tale of The Wind in the Willows written by Kenneth Grahame back in 1908, but have you ever wondered where the inspiration came from to write such a tale? I recently discovered exactly where Kenneth drew his inspiration from, it was during a holiday at the Greenbank Hotel in Falmouth. Kenneth took a boat trip from Fowey and whilst he was passing the riverbanks, he started to put together those very first thoughts to his novel ‘The Wind in the Willows’. The book began life as a series of letters which he wrote and sent to his son while staying at the Greenbank Hotel. 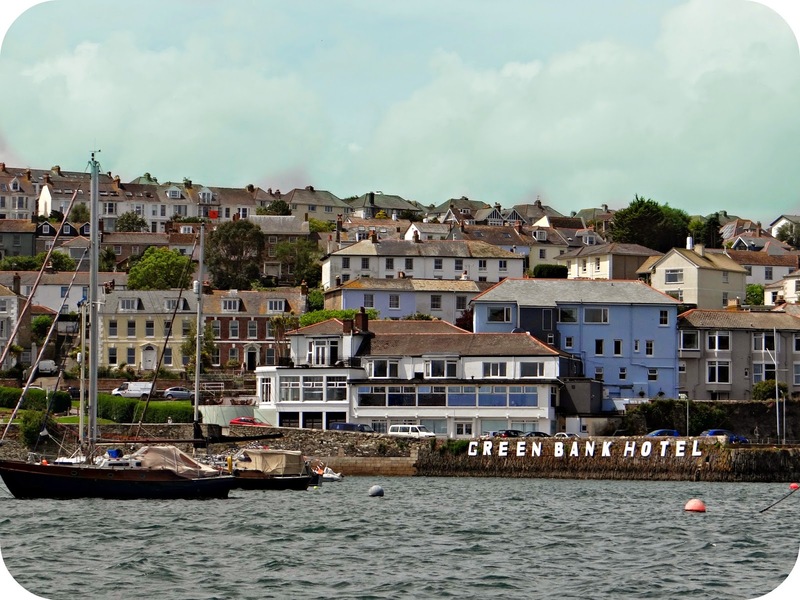 The Greenbank Hotel is the oldest hotel in Falmouth, dating back to at least 1640. Over the years it has attracted many well-known people throughout history. Back in 1907 Florence Nightingale stayed, and today you can even view her name in the hotel’s guest book which is still on display in reception. In recent years Ricky Wilson (Kaiser Chiefs) stayed and loved it so much…He went on to buy the house opposite! Today the Greenbank is a 4 Star hotel based right on the waterfront, and over the weekend I actually went along to spend a few days there. 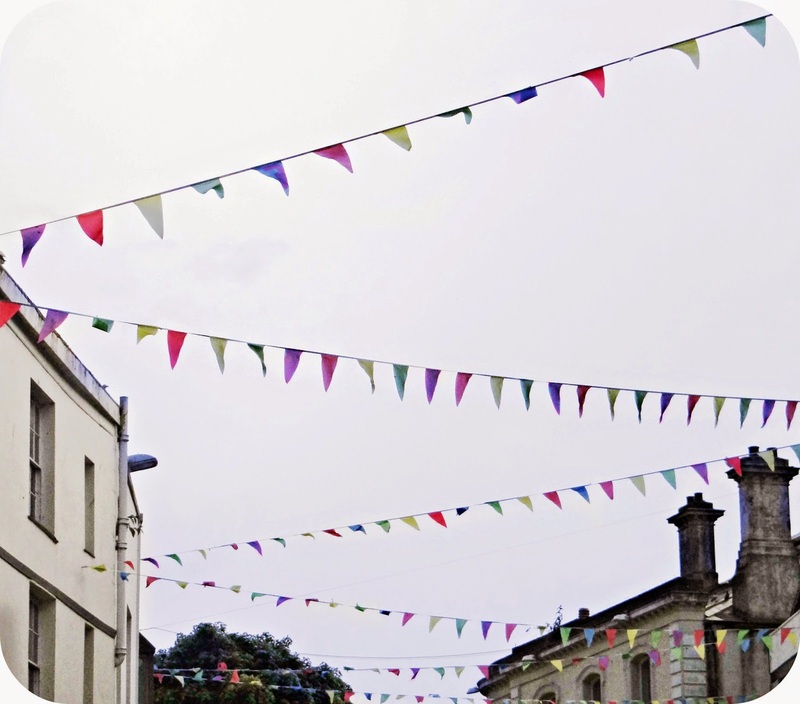 Having never been to Falmouth before I wasn’t sure what to expect, but as we entered Cornwall and the scenery grew softer I had a very good feeling. 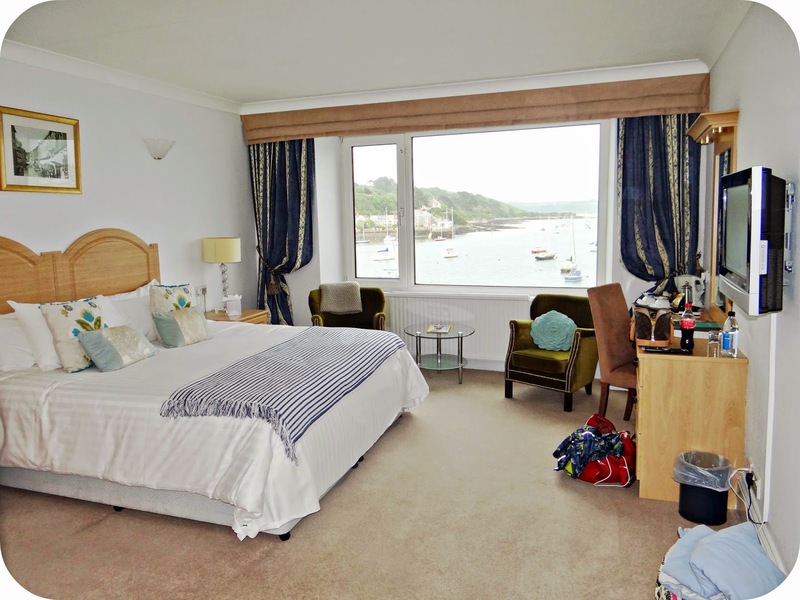 The hotel is situated in the heart of the harbour, and is within walking distance to the town centre. 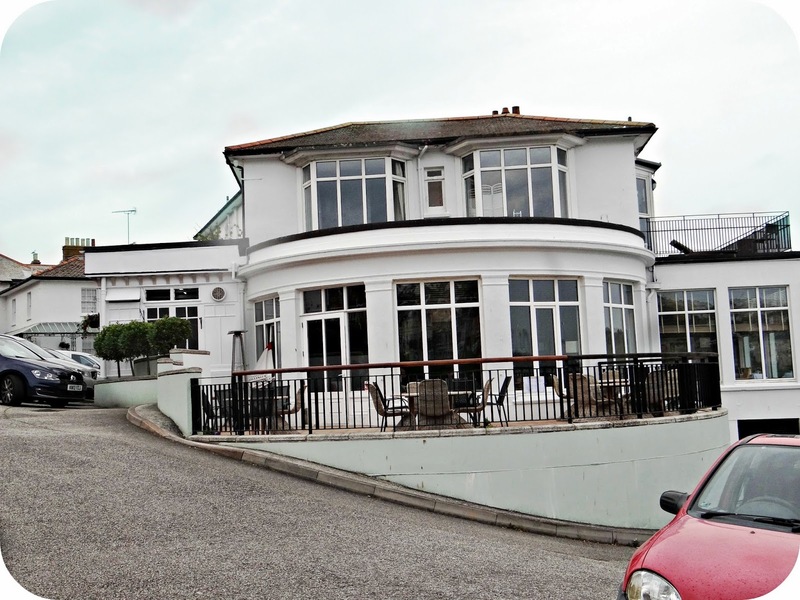 The hotel offers parking to guests and has a number of spaces available at the front of the property, or a small car park at the rear. Past the boundaries of the car park and down a flight of stairs you find the beach front, of course this depends on the time of the day that you are visiting. 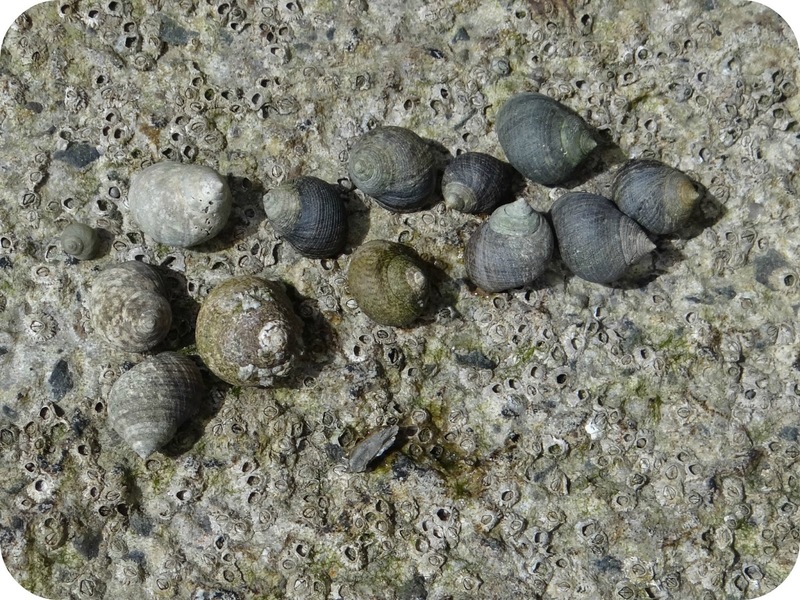 The tide is in during the morning and by the afternoon there is a small shell speckled beach, there are all sorts of treasures to be found. Sea creatures left behind by the waving tide, and a whole array of stones curved by the sea over many years. This is all just a stone’s throw away from the Greenbank Hotel itself. The hotel is a handsome looking building, and you can tell from just looking at it that it has been around to see a thing or two. Inside the character has been preserved, and while keeping things simple it has an elegant feel to it. Pieces of history have been preserved and show cased around the building, and they even have an old room rate list framed in a cabinet. We were greeted by the receptionist with a smile, she gladly checked us in and directed us up to our room where we would be spending the 2 nights at the Greenbank. We were offered help with our luggage and pointed in the direction of the lift. I was impressed that such an old building had a lift and it certainly made life easier getting all of our bags upstairs. The room was absolutely perfect, and was so much bigger than I had expected. We had asked for a family room as we were taking our 2 year old along for the weekend, the room consisted of a short corridor with a small room off to the left and then a little further down the master bedroom. The master bedroom looked out over the harbor, the view was just beautiful. 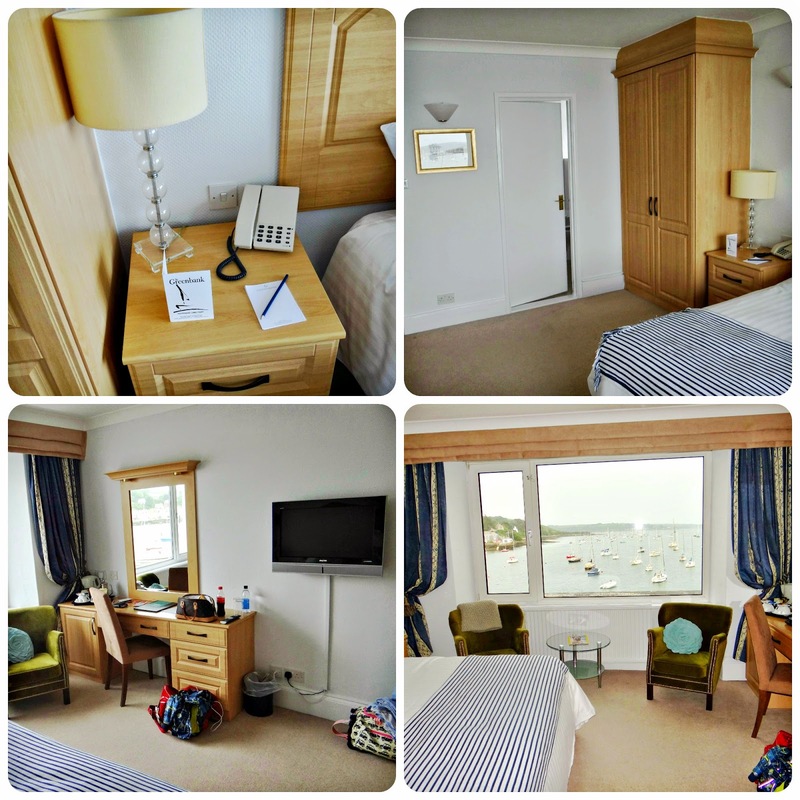 The room was bright and had a lovely fresh feeling to it and everything was exactly where it should be, the bed looked inviting and the sea front was calling out to the toddler. The bathroom had a bath with a shower combined and there were fluffy gowns hanging up in the wardrobe ready to be used. Leo’s room featured a bunk bed and a chest of draws, it was ideal. I thought that a family room meant that there would be a third bed in our room, not for a moment did I expect there to be an entire other bedroom for Leo. Suffice to say by this point I was more than suitably impressed. We booked ourselves in for dinner at the Harbourside Restaurant which is situated out the back of the hotel overlooking the harbor. It’s a beautiful view especially when you are enjoying a quiet Friday evening. We were promptly sat at a table and offered beverages while we were left with a menu each to mull over. They handed Leo a separate menu with the kid’s choices and we helped him choose what he wanted to have for dinner. After we had placed our order a waitress offered a choice of delicious looking baked bread. I had a piece of Pesto bread that was absolutely beautiful, and then our starters followed promptly. I had the Goats Cheese and Luke had the soup of the day, while Leo tucked into a Melon Boat, all equally well presented and very tasty. To follow Luke and I both had the Chorizo Chicken which had so many different flavours and was completely delicious, Leo tucked into Sausage and chips and managed to get sauce over the table cloth… The restaurant staff were fantastic and I got the feeling that it was a really family orientated place, which made our experience of dining with a toddler all the more pleasurable. For desert Luke and I tucked into a very moreish Sticky Toffee Pudding, while Leo enjoyed a bowl of ice cream. 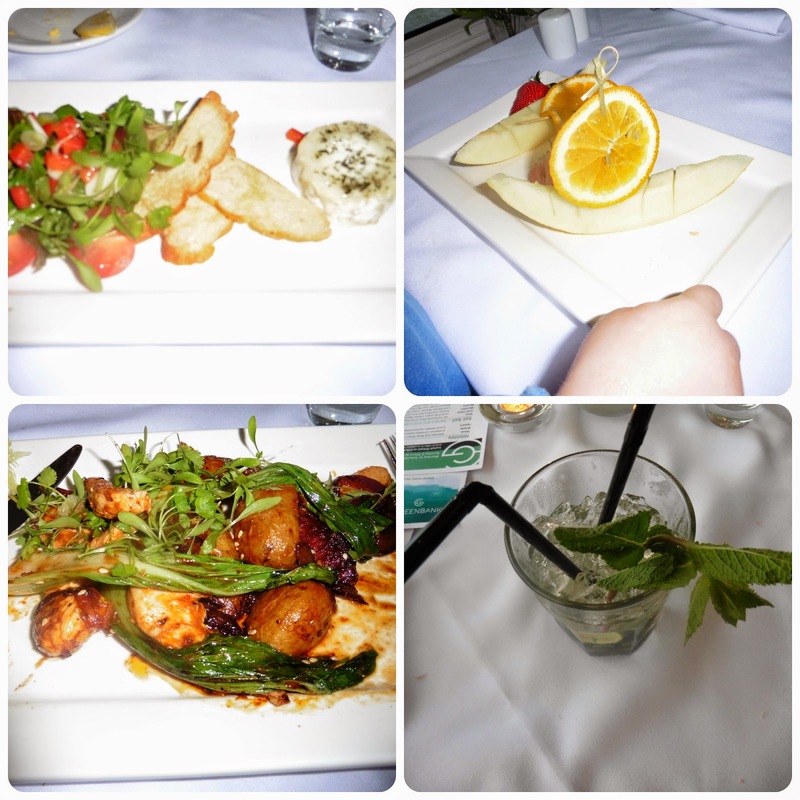 The entire meal from start to finish had been fantastic, the staff were attentive and efficient, they were great with Leo and really looked after us. Not to mention they gladly brought me through a cocktail menu so I could take advantage of the 2 cocktails for £10 deal they run on a Friday night! I got the feeling that nothing was too much trouble and they were more than happy to help, and this really shone through. I highly recommend trying a few of the cocktails as they truly are fantastic, my favourite has to be the Mojito closely followed by the Raspberry Daiquiri. With a full tummy and a tired toddler we made our way to bed, the view out onto the water at night was just as impressive as it had been earlier that day. Only now the boats were lighting up the nights sky. I tucked Leo up in his bedroom on the bottom bunk despite him greatly wanting to sleep on the top. He went off to sleep really quickly and had a sound night’s sleep, in fact I had to go in and wake him up the next morning so that we didn’t miss breakfast. Our bed was a great size, it had to be king-size or bigger, and it was incredibly comfortable. If I wasn’t determined to make breakfast I could have quite happily lay there much longer. Breakfast was more than worth getting up for, a nice selection of fruit juices, toast, fruit and cereals accompanied by the cooked breakfast menu. 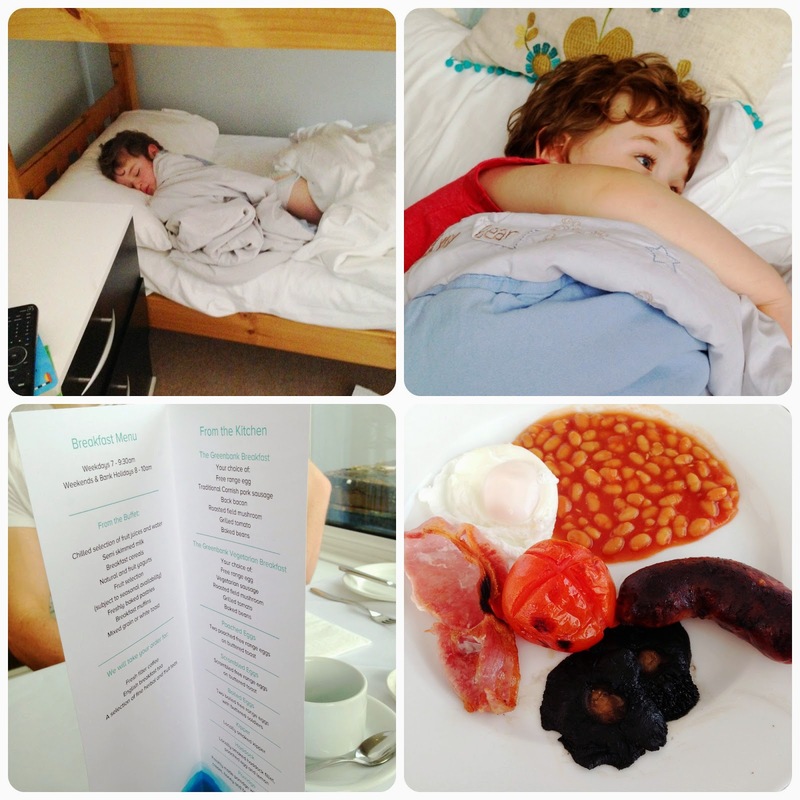 Leo tucked into the fruit and breakfast muffins and even tried a small version of the English breakfast. Both Luke and I tucked into the Full English and thoroughly enjoyed every mouthful, the sea air had certainly given us good appetites. The breakfast service was friendly and was again served in the Harbourside Restaurant, we were fed and ready to start our day visiting local attractions around Falmouth. With the town being a short walk away (longer if you haven’t brought a pushchair for the toddler who refuses to walk..) we decided to take a stroll into town. 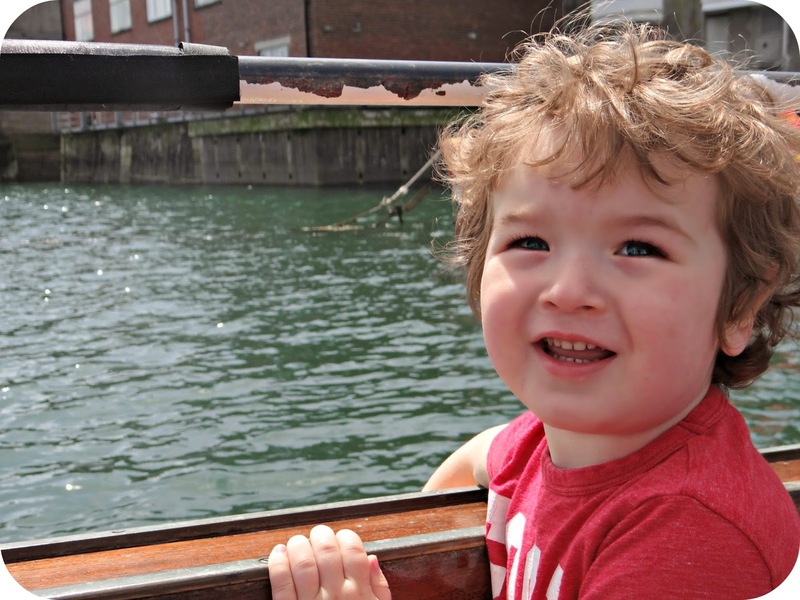 The plan was to find a boat ride as this is all Leo wanted to do since we had arrived the night before. 5 minutes’ walk away there is a pier with a number of different companies selling their boat tours. We signed up with the one that was leaving soonest and had a lovely cruise around the harbour. The sun was shining and it was great to hear about the local area as we passed by. We saw that the National Maritime Museum was just a little bit further down and decided to pay a visit a little later that day. Back on shore we took a walk to the Falmouth Aquarium where Leo was really pleased to see Nemo and Dory. The aquarium is set out over 3/4 levels but there are only fish tanks on the bottom and first floor. 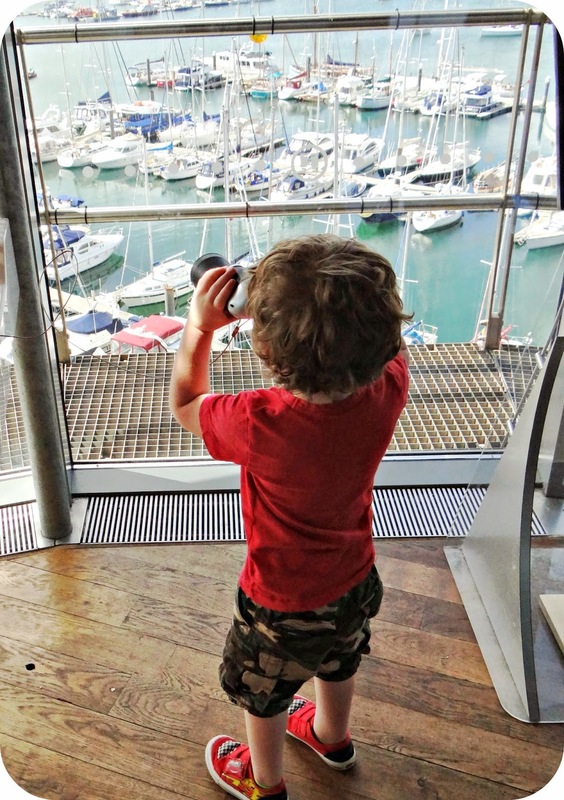 The rest are filled out with interactive activities for visitors to participate in, Leo however decided all he wanted to do was look at the fish but he seemed to really enjoy his time there. The National Maritime Museum is about 10/15 minutes’ walk from the hotel, of course I ended up carrying Leo pretty much all the way so it definitely felt like longer. If you have little ones I highly recommend you take the pushchair as you will definitely be giving your arms a good work out if you end up carrying them the length I carried Leo.. The museum was really interesting and thankfully upon arrival Leo decided he was happy to walk, of course seeing the helicopter on display (That you can go inside!) he decided his time would be much better spent playing. 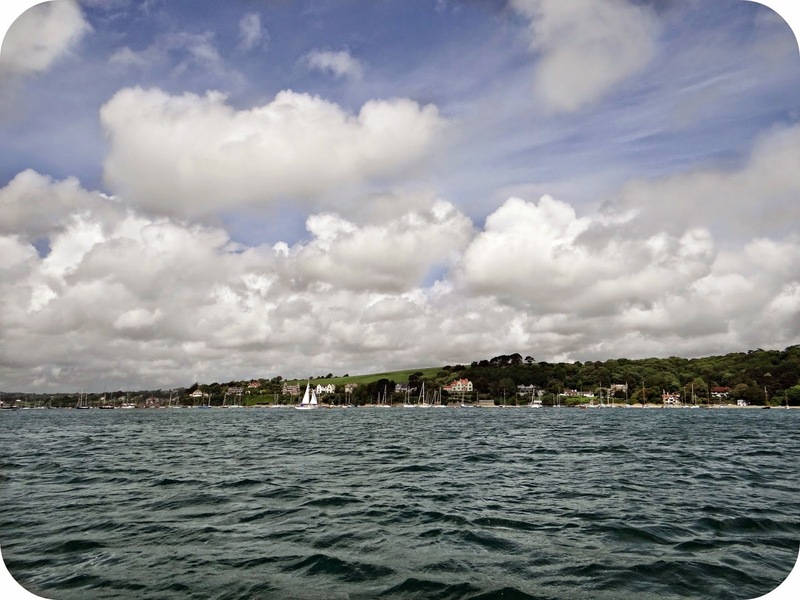 Our stay in Falmouth and at the Greenbank was a really pleasant one, there was so much to see and do, I could have happily spent a week there. We didn’t even begin to touch the tip of the attractions and activities that you can do during your stay. I really wanted to take Leo crab fishing off the pier but unfortunately we ran out of time. A big thanks to all the staff at the Greenbank Hotel for looking after us all so well, we had such a good time and I will definitely be bringing Leo back in the future. Disclaimer: We were invited along to the Greenbank Hotel and enjoyed a complimentary night in exchange for our honest thoughts and opinion. All views expressed are completely my own. Life is all about making memories with those closest too you. 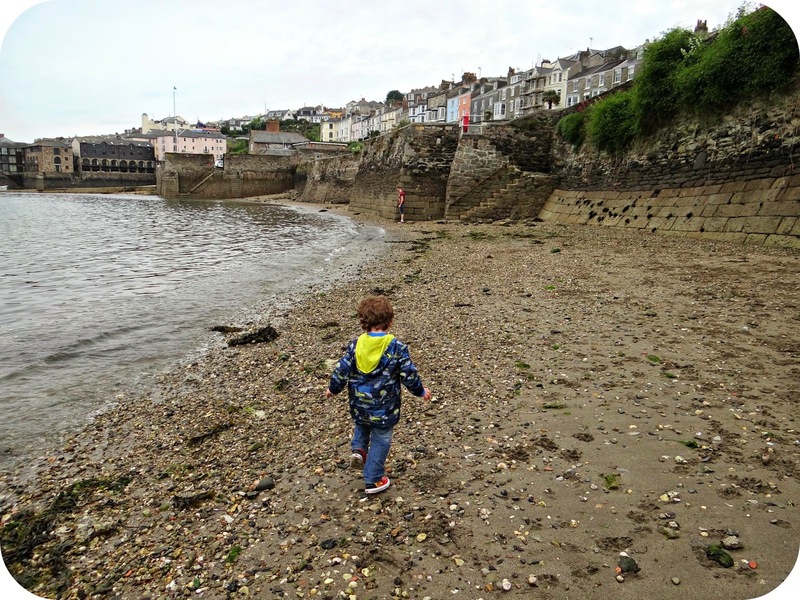 Just last weekend I visited Cornwall with my little guy, and we skimmed stones into the sea and took in the fresh sea air. 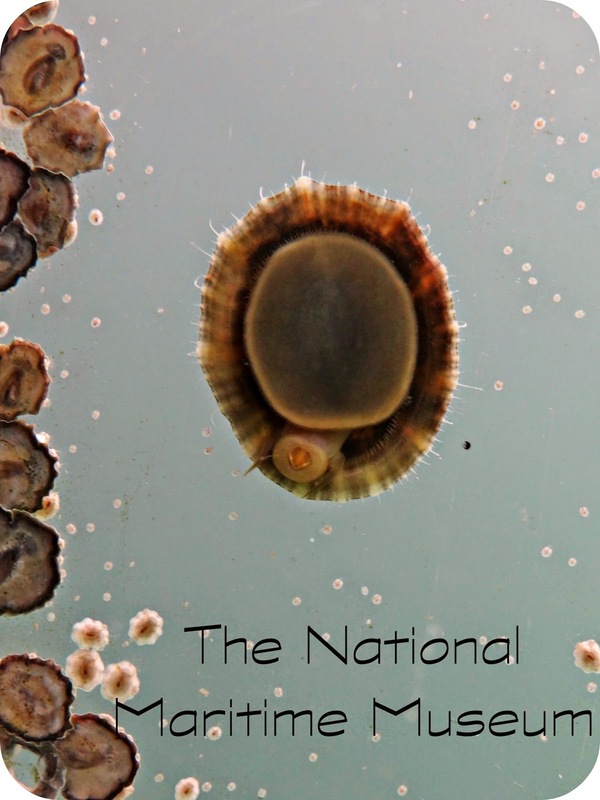 We spied fish swimming in the shallow waters and visited the Maritime Museum. It was a weekend full of fun, and Leo had an absolutely amazing time. We all have special memories of a special place with your nearest and dearest, it may be a seaside destination like Cornwall or maybe a camping trip, whatever the occasion the UK really is full of some very special places. I know that in the past I have over looked these destinations, but I only have to venture out of my front door to find the Cotswold's. It amazes me how people travel from all over the world to see the beauty that the Cotswold's have to offer, and it also highlighted to me that I really do take it for-granted. Ukbreakaways are currently running a competition, they want you to share your passion for the UK by way of a travel related blog post. It could simply be a personal guide to the destination you want to talk about, or a 'Top 10 Things To See or Do' type post. All you have to do is use your personal insight and experiences. The entries will be judged based on the content of their blog post and how it is being engaged with, the judging panel consists of Ukbreakaways Managing Director, Business Development Manager alongside a member of the Reservations Department. The winners will be notified no later than Friday 6th September 2014. Entrants must be over the age of 18. You must follow the instructions on 'How to Enter' to ensure your entry is valid - all entry instructions form part of these Terms. The Prize offers no alternative. Ukbreakaways reserves the right to publish winners names via Social Media or via their website. Competition is not open to employees or agents of Ukbreakaways (Travelstyle). No purchase necessary. One entry is permitted per person. The prize winners will be contacted initially via their Twitter account with further instructions. The promoter's decision is final and binding in all matters relating to this competition. 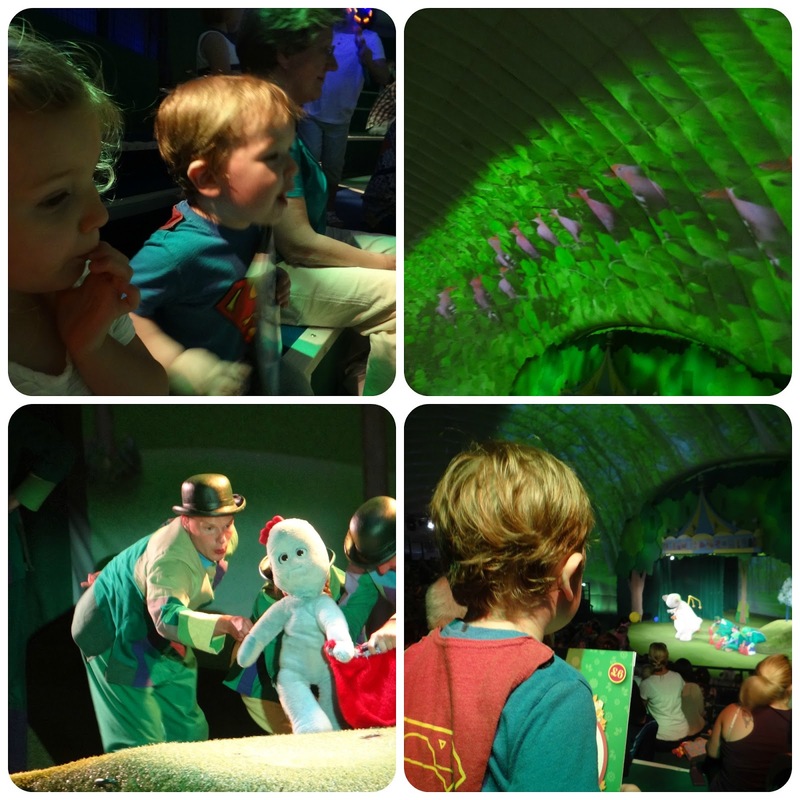 In The Night Garden Live is back on the road again, and after having such a great time last year I am really looking forward to taking Leo along again. Our tickets are booked and we are currently in the process of deciding what extra’s we want to book prior to attending. 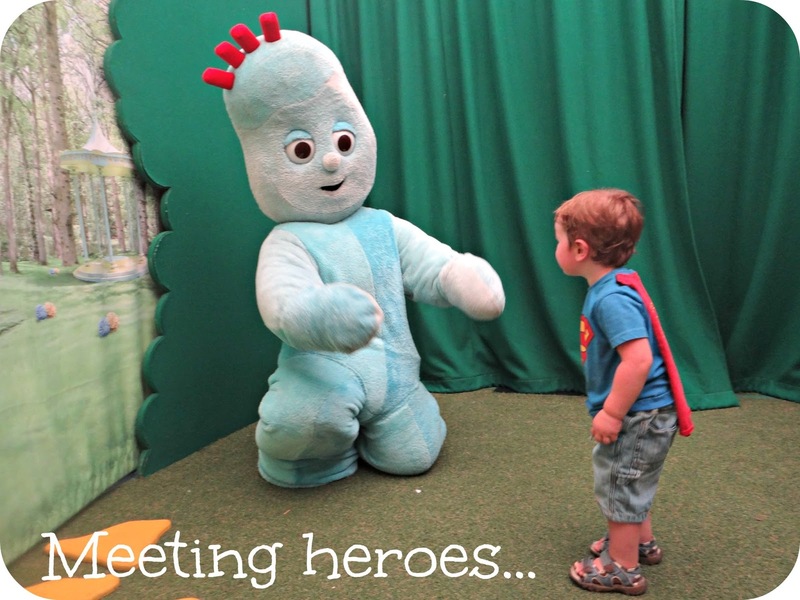 Last year we added in the goodie bag and even got to meet Iggle Piggle himself! I found that these additional touches made the day extra special for Leo, but of course this did mean an additional cost to foot and it certainly isn’t a cheap day out in the first place..
My first piece of advice to anyone considering a visit to a In The Night Garden Performance would be to consider when you want to visit, the prices of tickets vary depending on the day you will be visiting. Prices start from £17.50 per person for standard seating and £28 per person for Premium seats. Last year we sat in the standard seating and these were absolutely fantastic due to the way the benches have been arranged, it means that everyone gets a perfect view. This year we have treated ourselves to the premium seats just to see how it differs from the standard. If you are going to be taking a baby along it is worth knowing that you will have to pay for them, even for babes in arms. This is an aspect that really surprised me last year when we took along my friends 6 month old, it turns out that babies under 6 months old get half price tickets… But for babies over 6 months old it is then full price. I still do think that this is a expense that isn’t necessary, but I do appreciate that this experience is completely unique so if you’re like me and want to go, sometimes we just have to bite the bullet and let it go for a day. 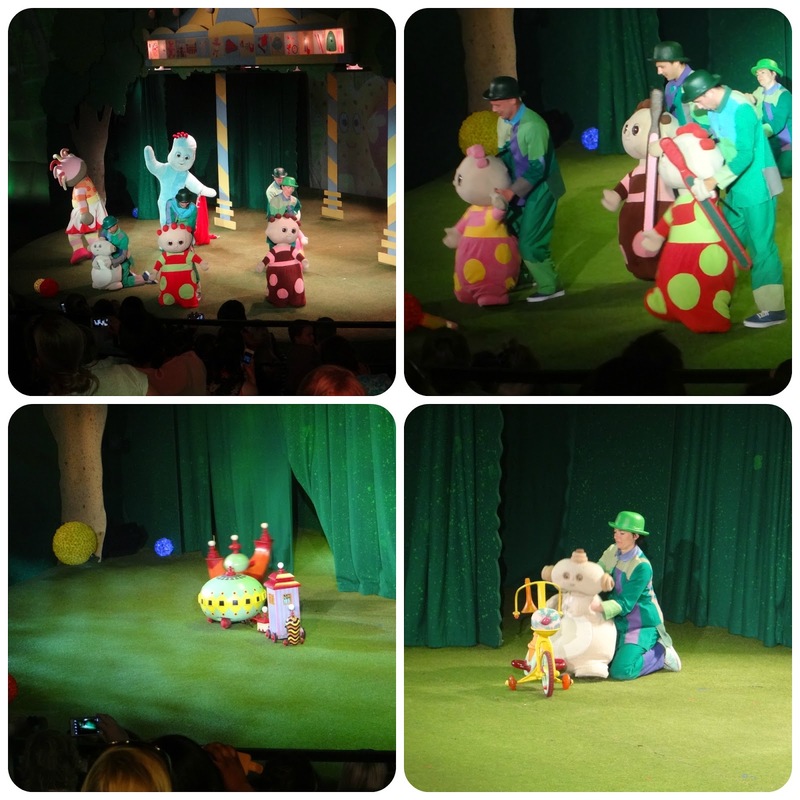 There are two different shows to choose from, The Ninky Nonk show see’s Iggle Piggle loosing his blanket and all of his friends try to help him find it. In the Pinky Ponk show Makka Pakka plays a prominent role, and goes around washing everybody’s faces. Until of course… His sponge gets stuck in Upsy Daisy’s megaphone! I have only had a personal experience with the Pinky Ponk show, and we loved it so much that we are going to watch it again! One thing that I do think is essential, and that is to look ahead of time at the extras and pick out what if any you would like to include within your visit. Will you want a goody bag for your little one? Will you want them to meet a character at the end of the show? In my personal experience I found it much easier to total up the costs ahead of time and pay for it ahead of time, rather than going along on the day and splurging without having budgeted for it. They do special before show prices on the goody bags which brings them to £24.00, if you want to buy the same goody bag on the day of the show the prices go up to £29.00. If you are interested in purchasing a goody bag I do highly recommend doing it ahead of time to save yourself some money. The goody bags are generous and come with a good range of items, I did come away from the show last year really pleased with the goody bag that Leo received. I will definitely be pre-ordering a goody bag for our next visit. What I did think was really good is that they switch up what is in the goody bag each year, so even though Leo had one last year we won’t be duplicating all the items by having a second one. So you have now ordered your tickets and pre-ordered your goody bags if indeed you want one, now what about character meet and greets? These are again an additional extra. 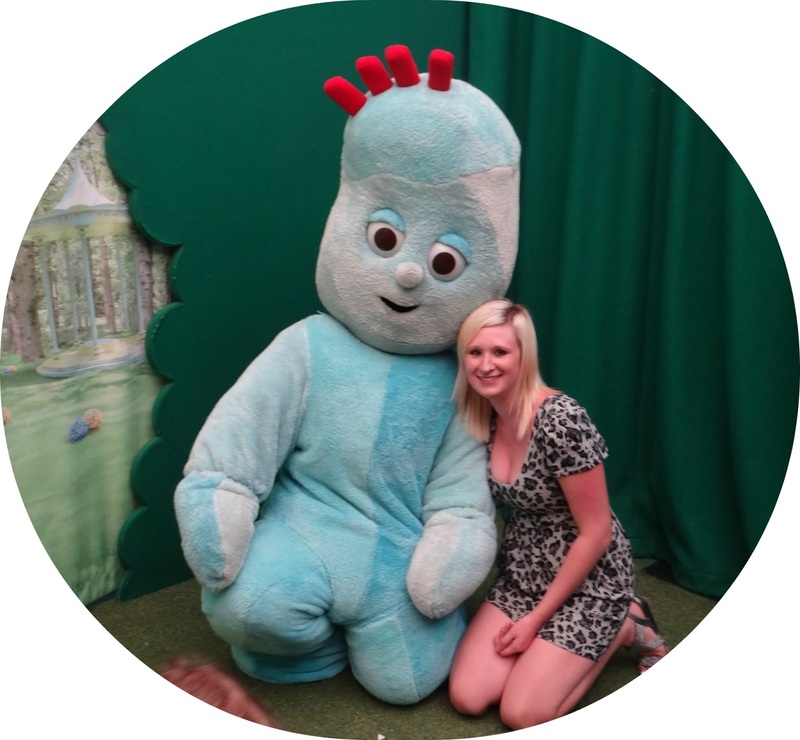 For £15 you can meet either Iggle Piggle or Upsy Daisy after the show has ended. 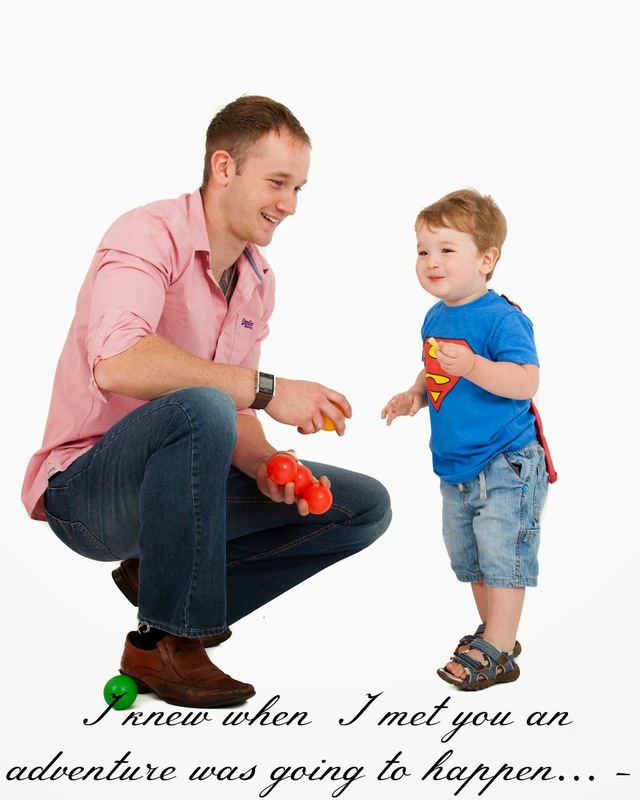 Pre-booking your ticket ensures that you will get to meet your little one’s hero, but waiting until the day can mean they are fully booked or you have a longer wait. If you are booking a character experience I would personally do so prior to visiting the show, that way the cost is upfront and you know that you will get seen. 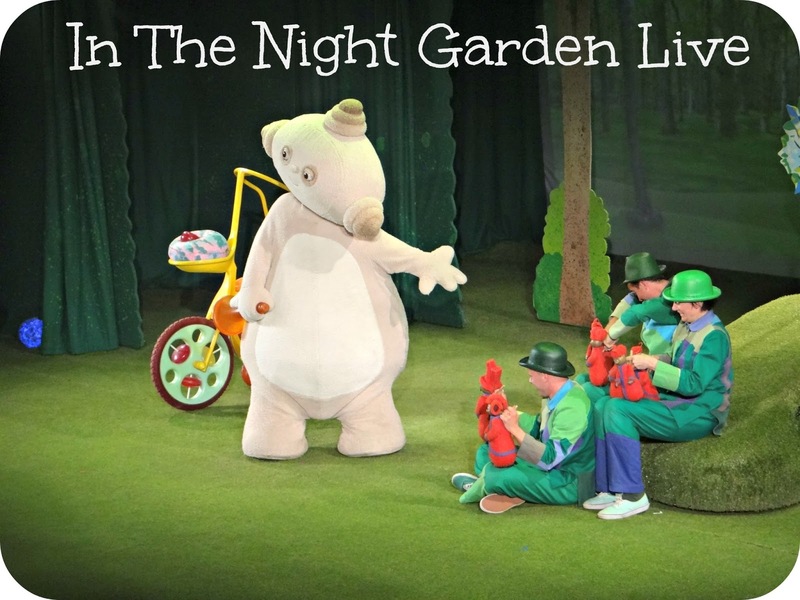 In the Night Garden Live takes place in its very own Showdome, a purpose built venue just for the show. It really is rather impressive, especially when you take into consideration that this show travels around the country. 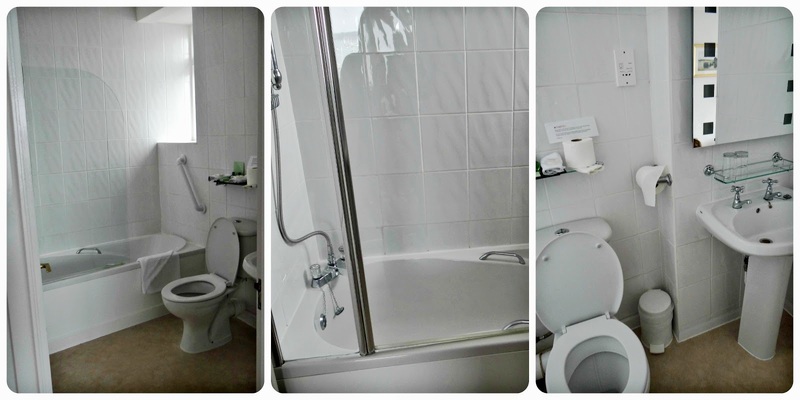 It has plenty of toilets, baby changing facilities and buggy parking all under the one roof. The seating arrangements for the show are spread over just 13 rows, this means that wherever you sit you will be able to see everything that is going on. This was great when we took Leo and his friend as 2 year olds, we didn’t have to lift them up high, they could just sit and enjoy the show. In all the excitement we almost forget to consider the most practical of aspects. In The Night Garden Live is a busy day for kids and grown up’s a like, and then of course there are the travel timings. Sometimes it is just easier to find a hotel for the night, and worry about the journey back the next day after a good night’s sleep. Of course with the expense of a fun filled family day out you don’t want to break the bank, you want a family friendly hotel within close proximity to the London showing. A couple of good options would be the Holiday Inn at Kensington which is only 19 minutes away by car, and the Holiday Inn at Mayfair which is just under half an hour away. The most important thing is to go along with your little ones and have an enjoyable day, Leo and I had such a great time last year and I know that this year will be just as great. We have opted to see the Pinky Ponk show again as one of Leo’s favourite characters is Makka Pakka. If you are going along I hope you all have a great time, I am sure you will! 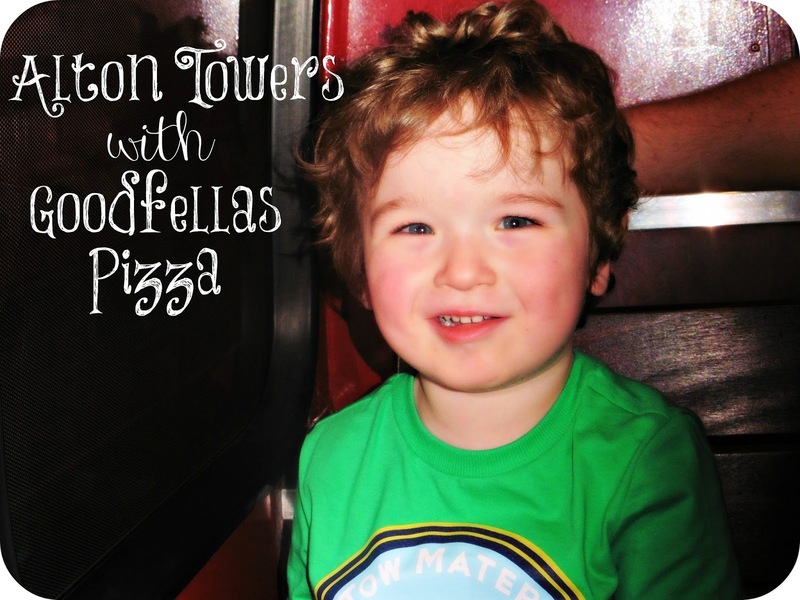 Last weekend we were invited along to Alton Towers with Goodfellas Pizza to see the very original Pizza Vending Machine, but more on this a little later! 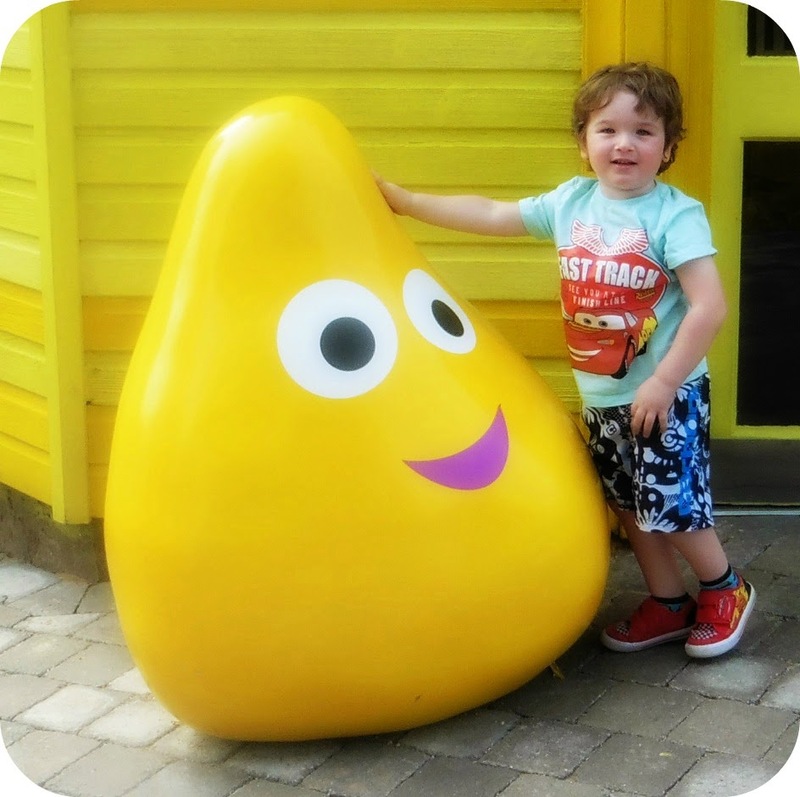 A trip to Alton Towers made us all rather excited, especially Leo who was over the moon to be able to head to see the new Cbeebies Land that opened a few weeks ago. We live about 2 hours from the park, so we set off early so that we could make the most of our time there. Leo had been telling everybody that he was going to ‘Cbeebies Land’, so we made this part of the park our first point of call. 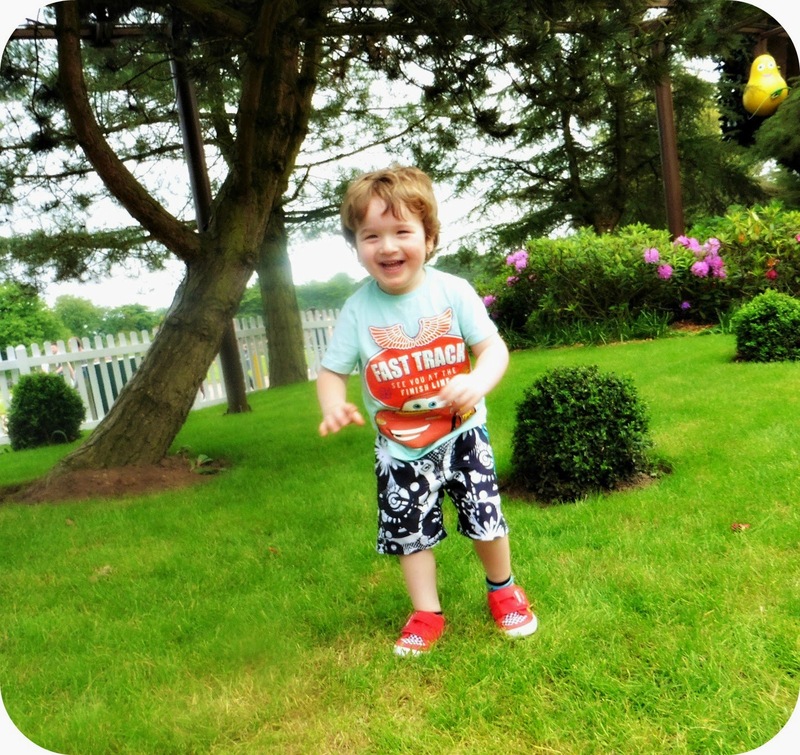 Walking through the park I recognized the sights and sounds straight away, coming to Alton Towers as a child and having such a good time meant that I had high hopes now that I was bringing my own child along. Having had a look on the website before coming, I knew that Leo was going to be able to enjoy his day. 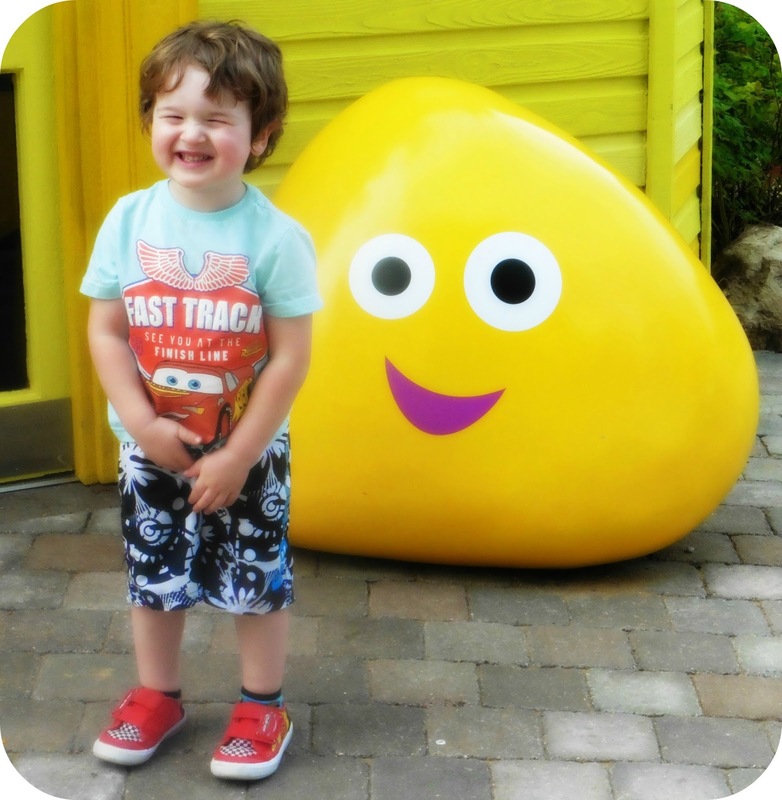 We soon arrived at Cbeebies Land and I was so looking forward to seeing Leo’s reaction. Upon arrival in Cbeebies Land I was really impressed with how it looked, the vibrant colours and not forgetting the stars of Cbeebies handprints in the pathway! We did soon realise that we were going to be in with a bit of a wait for the majority of the rides. Everywhere I looked the ride times were getting longer and longer, to the point I thought that it was beyond realistic to attempt with a 2 year old. 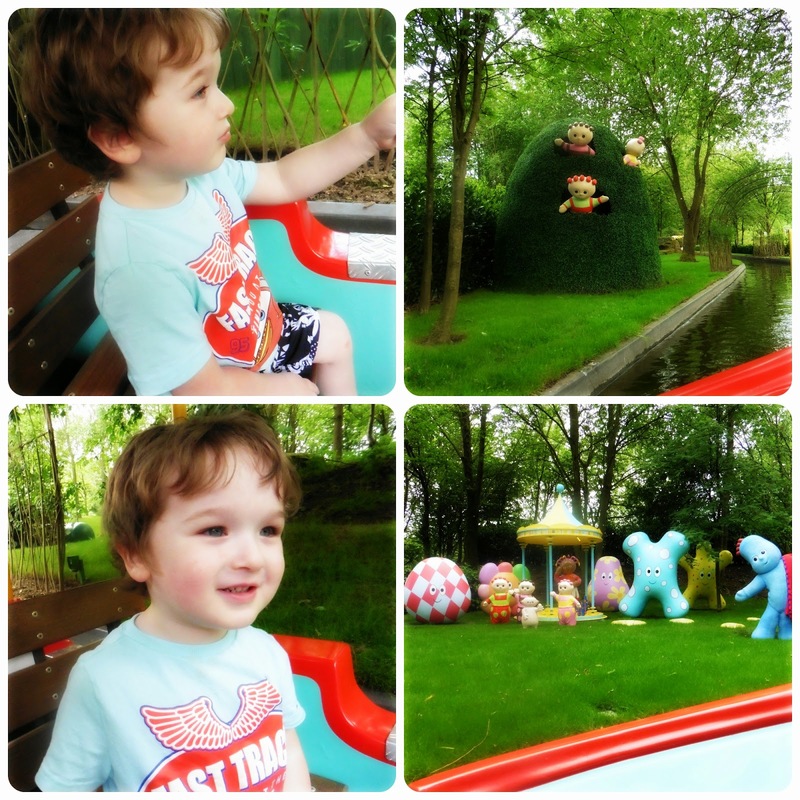 The In The Night Garden Magical Boat Ride was estimated at 70 minutes. A whole hour and 10 minutes… This was one of the rides that we had been really looking forward to getting on, but I took this as a sign that we should come back later. We headed into the Play Zone where Mike The Knight was due to come on stage, it was a great little area covered with astro turf, plenty of picnic benches and space for the kids to run around. Leo was feeling a little sorry for himself at this point, within minutes of him getting into the park he had taken a tumble and cut his leg, and not even the pretense of Mike the Knight could bring a smile to his face. Mike the Knight soon came out and the kids all around us squealed, he was accompanied by his sister Evie who has a habit of casting spells that often… don’t go to plan! Leo sat on my lap and enjoyed the show, but he was still feeling a little sorry for himself when it came to a close. I thought the Mike The Knight Show was good, the costumes were great and the storyline was simple to follow. I really liked how they picked kids out of the audience to come up and assist with certain aspects of the show! 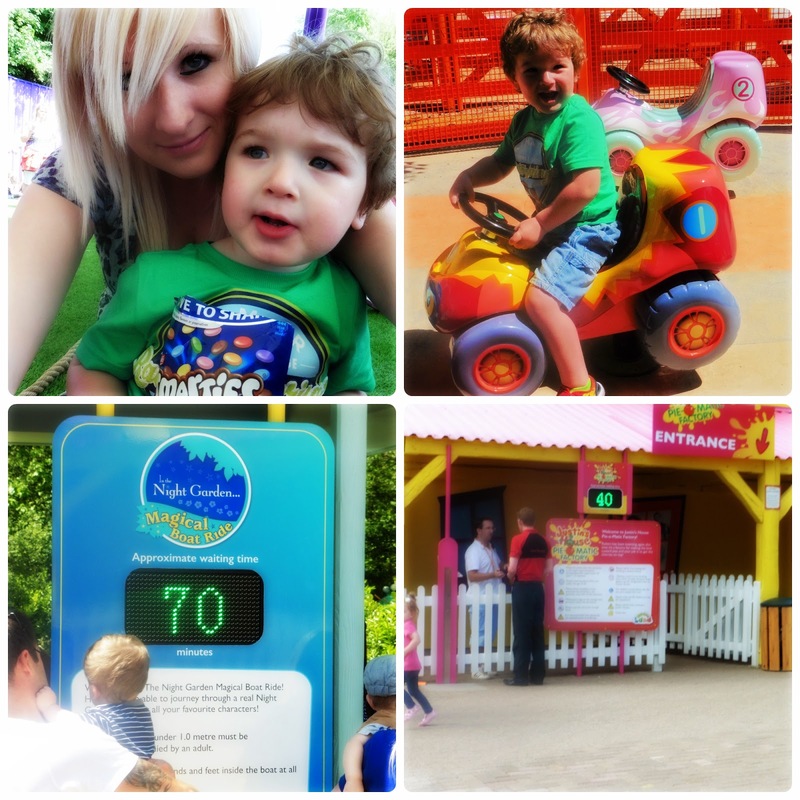 We didn’t stay in Cbeebies land much longer after this as the rides were still really busy. We did pop onto the Num Tums Merry Go Round, but this didn’t seem to excite Leo’s fire either… Leo at 2 years old already loves a good rollercoaster so we came to the conclusion after looking around, that our time would be better spent outside in the rest of the park. Leo is just under a meter so although he cannot go on everything, he can get on all of the 0.9 height restricted rides, and he is so close to being a meter that the next time we visit I expect a whole new selection of rides will have opened up to him. Leo experienced the Battle Galleons, the pirate boats that you can shoot water at your fellow pirates. I already had an idea of how this may go… Leo loves to play with water, he loves to shoot water at un-suspecting friends and family.. So in this respect the Battle Galleons were going to be a big hit! But I was also very aware that Leo would not like to be on the receiving end of being shot at… And I couldn't have been more right! So in typical fashion I invested in in a waterproof and spent the entire boat ride hiding, Leo spent it laughing as he shot and screaming hysterically when he was shot… Thankfully it was a warm day so we dried off pretty quickly! Second up was the Congo River Rapids! These are a ride that I always enjoy, and I was so pleased when Leo was tall enough to give them a go too. 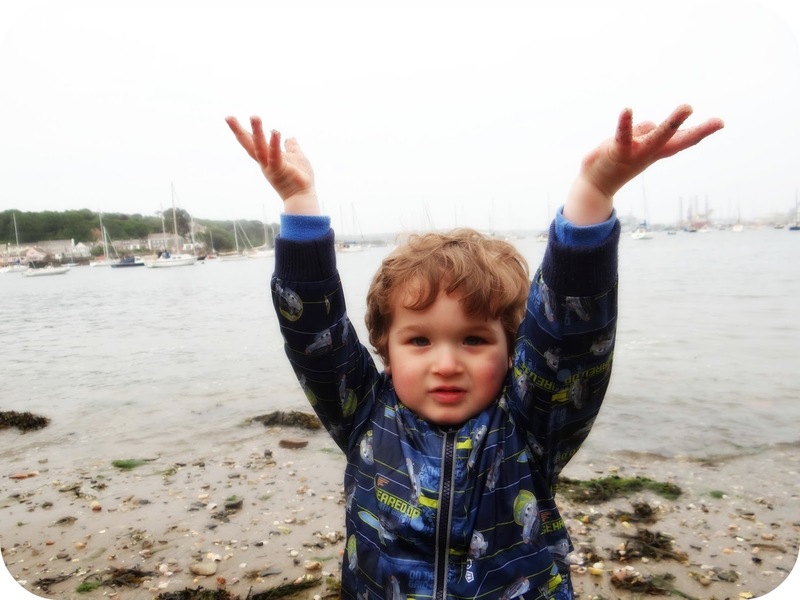 Leo’s first response was ‘no wet Mummy!’ ‘No boat!’ and I reassured him that it wouldn’t be as persistent as the Battle Galleons… I told him he could potentially get a little wet and he took me at face value. Hopping into the rubber dingy Leo was excited, he was smiling and giggling. He giggled some more as the rapids began to bounce us along, he even giggled as the first splash flew into the dingy, he even smiled when the second one hit. The third one however was more like a tidal wave… This one was not so well received by the toddler. But even with sodden shoes he managed to enjoy the rest of his first rapid ride! Upon drying off Leo was finally back in to his chirpy self. We were now well into the afternoon, and as we had left the pushchair at home because Leo promised he would walk… My arms were now aching, as in true Leo style… He had indeed refused to walk! We took the opportunity to hop on the Runaway Mine Train, this is a rollercoaster that I LOVED as a child. I remember going on this with my Dad on our family visits. Now here I was with my 2 year old about to take Leo on his first ride. I knew that this was instantly going to be a hit. Leo is already an adrenaline junkie! As we got strapped into our seats Leo already had a big cheesy smile on his face, and that smile just got bigger as the ride went on. He absolutely loved it. The lining up times for each of these rides was not very long at all, and in comparison to Cbeebies Land it paled in comparison. We took this opportunity to grab something to eat and took a short walk around the grounds. 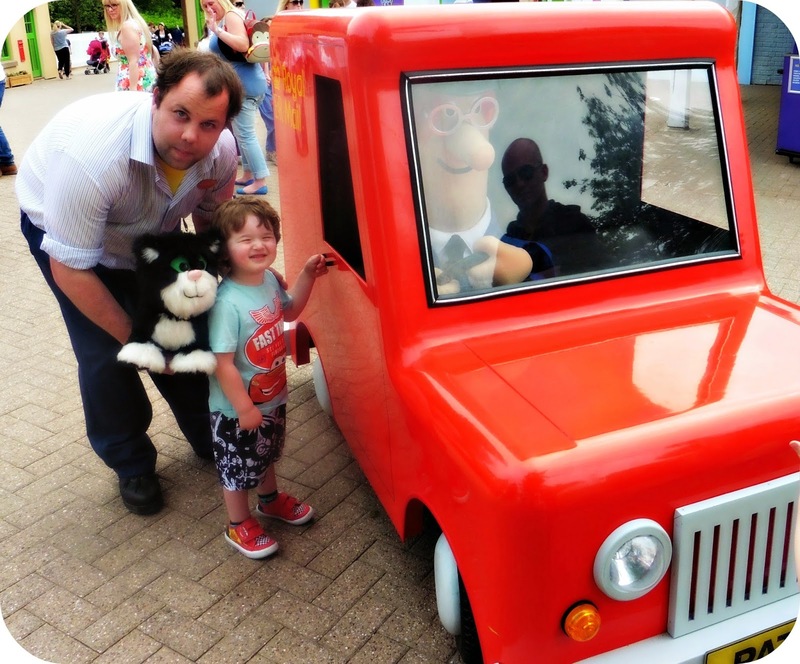 Then I decided to head back to Cbeebies Land and give it a second shot. It was now around 4pm so I had hoped that people would now have started leaving for the day, and that the line times would have reduced considerably. The In The Night Garden Magical Boat Ride was now down to 50 minutes… I decided to get in line and see what happened. I think in the end it took us 30 minutes to get to the front. I did like that there were activities built into the line to help keep the kids entertained, but at the same time I thought 30 minutes wait for a child was still a considerable amount of time. With our day coming to an end we began to make our way out of the park. It was around this time that we came across the Goodfellas Pizza Vending Machine! 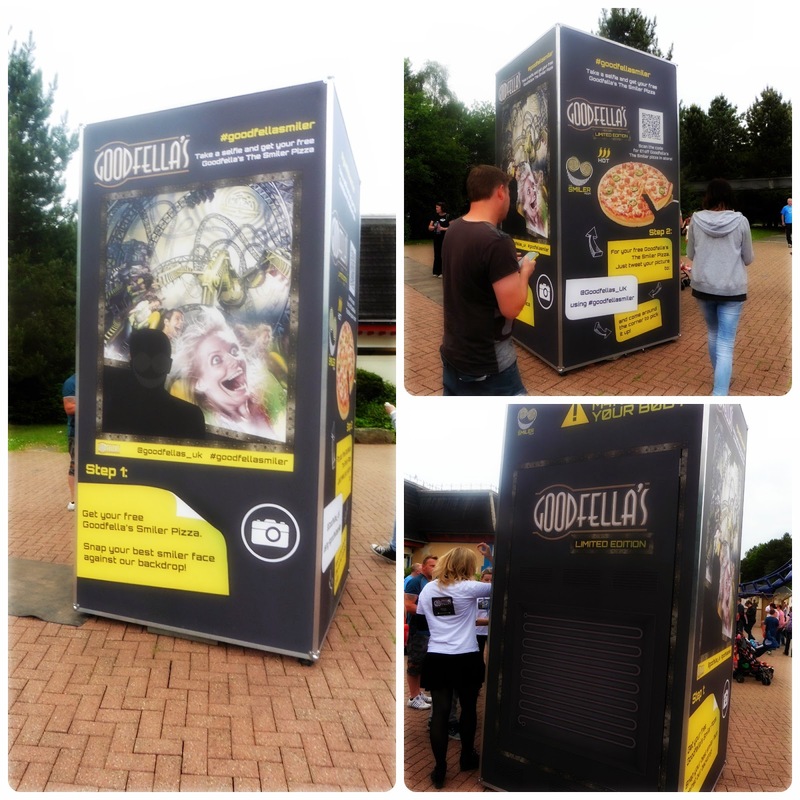 Goodfellas were at Alton Towers celebrating the launch of the new Smiler Pizza. This pizza is named after the hypnotic 14 loop rollercoaster, The Smiler. The Goodfellas Pizza team brought along around a 1000 pizzas to giveaway to pizza lovers at Alton Towers on the 31st May and 1st June. The vending machine was the world first ever selfie-powered vending machine. 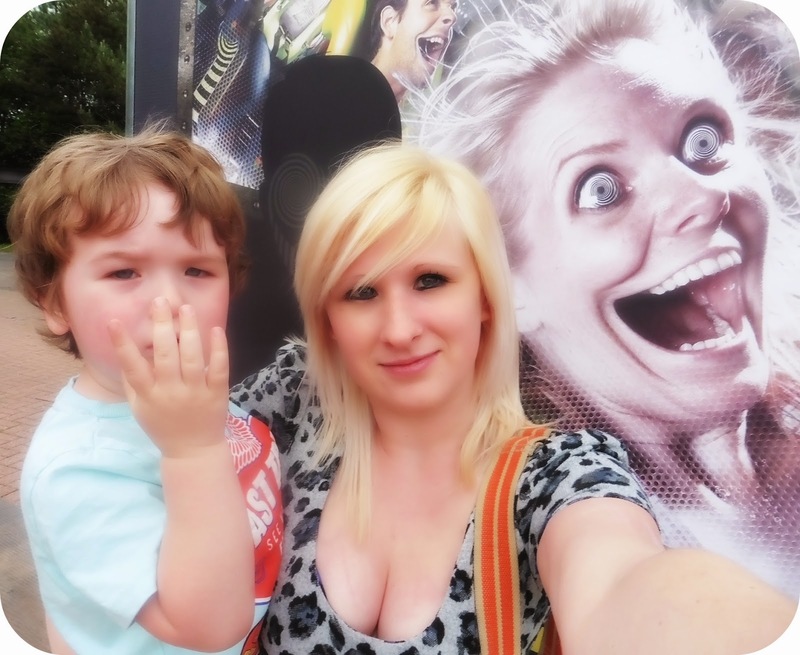 Passers by were asked to snap their best rollercoaster face in return for a Smiler Pizza! We will be posting a full review of the Goodfellas Smiler Pizza very soon! Over all we had a fantastic day out at Alton Towers, a big thank you to Goodfellas Pizza for inviting us along and for letting us loose around the park. Disclaimer: We were provided complimentary tickets to Alton Towers to try out the Goodfellas Vending Machine, in exchange for our honest thoughts and opinions. 15 days have flown by, and now Leo has spent 2 weeks and an entire day in big boy pants. All of a sudden Leo is really taking to his new responsibility, and is relishing the praise and treats he gets when he uses the potty. Leo has even managed to get to the potty in time for a number 2! Of course he waited until I was at work to demonstrate this latest trick. Last Wednesday I got a text telling me the big news, and I was suprisingly proud to hear what my not so little baby had done! We are entering a phase where Leo is quite happily telling us when he wants to use the potty, and today he has made it an entire day with almost no accidents. This morning Leo was dressed as usual, in place of the nappy that he has always worn until recent weeks, he donned his pants. Being Monday Leo was off to Nursery, and this would be the second occasion that he has worn pants. Last Monday Leo went and had multiple accidents as he was so engrossed in his play. Today Leo went along and did ever so well. Leo stayed dry the entire time, he told the Nursery staff each time he needed to go, and when Granny went along to pick him up they were full of praise. The dry spell continued all day, I got home from work at 5pm and Leo was still in the same pants he had been wearing that morning. It was only when Granny and I took him out in the car, and Leo fell asleep for a short time and he woke up disorientated that we had an accident. It didn't happen while he was asleep though, it was just after we had got back into the house. Leo was sad about his accident but we soon managed to cheer him up. 15 days in pants has been a experience for both of us, but I think it is now starting to become easier. We can go out further a field and we just have to make sure that we have a potty close to hand. When we took Leo into town last week, we just put a potty in the basket of the pushchair. We took him to the toilets and he even sat in the boot of Granny's car! We are getting through stickers like they are going out of fashion, which of course is a good sign. 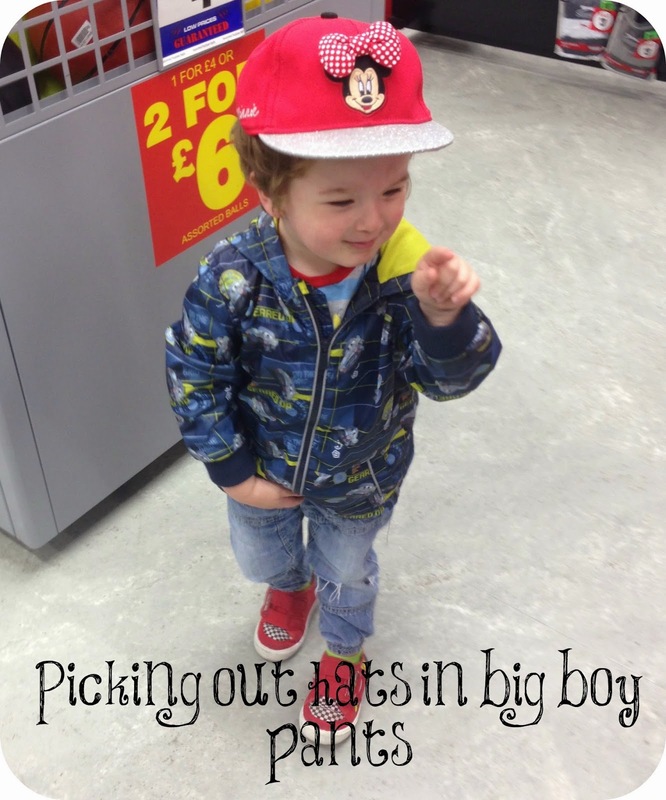 I am so pleased that we are getting the potty training ball rolling before Leo's 3rd Birthday this month! 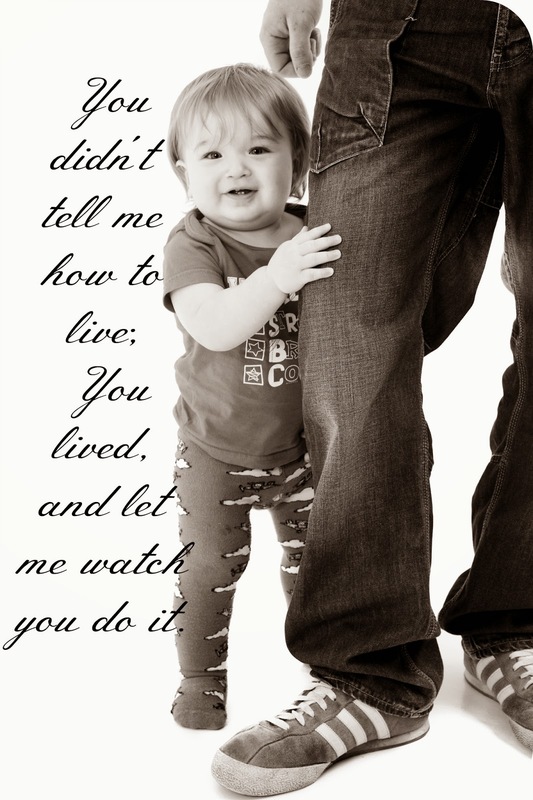 There is a dedicated day each year for us to let the Dad's of the world know how much we appreciate them. Of course really we should be doing that every day throughout the year, but Father's Day is a day that we can really pull out all of the stops. It's a great excuse to get the entire family together, eat tasty food and have a couple of drinks. As Father's Day falls in June it has the potential promise of sunny weather, and sunny weather means BBQ's and in our case... Mojito's. This post is an entry into the Hampergifts Father's Day Giveaway, and I thought I would hand the reins over to Leo, to tell you exactly why his Daddy deserves to win a luxury hamper to present on Father's Day! These are some of my all time favourite photos, and I think their beautiful relationship highlights exactly what Father's Day is all about. 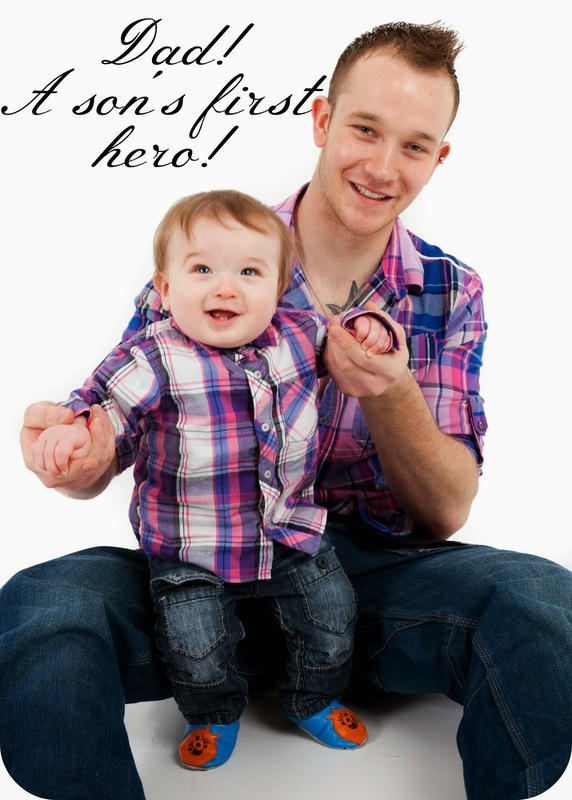 What will you be doing this Father's Day? Here we are 1 week and 3 days into potty training, and we have had some fantastic moments and some not so great moments. Over all though Leo has been doing fantastic. The accidents that he has been having, I know are more on the lazy part and cannot really be classed as 'accidents' as they are deliberate. Leo will have a stubborn moment where he knows he needs a wee or a poo, and point blank refuses to use the potty. Or... 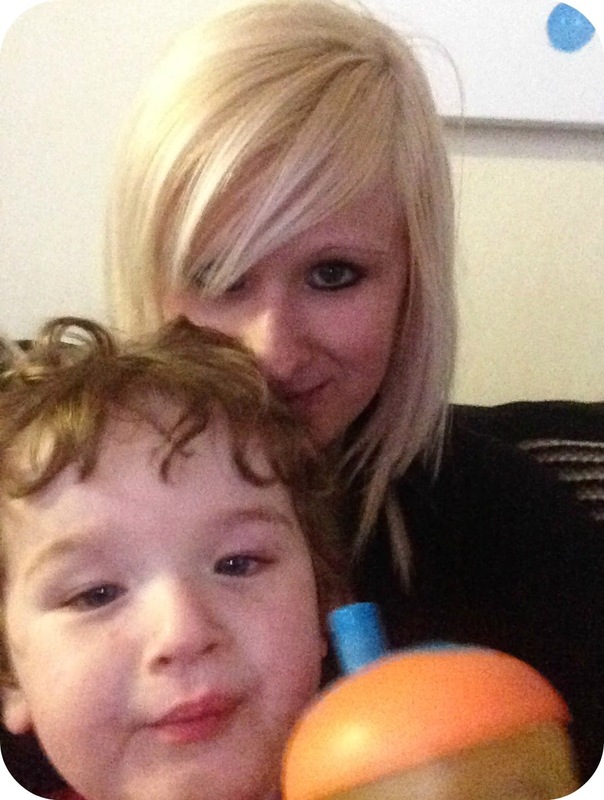 He will disappear out of the lounge and into the play room, only to return moments later declaring 'Mummy!! POO!' and I discover that sure enough... You have avoided the potty.. again. The 'accident's' seem to happen more in the morning, and as the day goes on Leo get's better and better. In fact as the week has progressed the accidents have become less and less. Monday saw Leo going to nursery in pants for the very first time. We left the nappy at home and I sent Leo off in his Planes pants, of course being in such an active environment with lots of other children all playing hard... Accidents were expected, and nursery did such a great job asking him if he needed to go, and changing him when he got to carried away! Although we get through a few pants a day, we have pretty much cast nappies aside during the daytime. 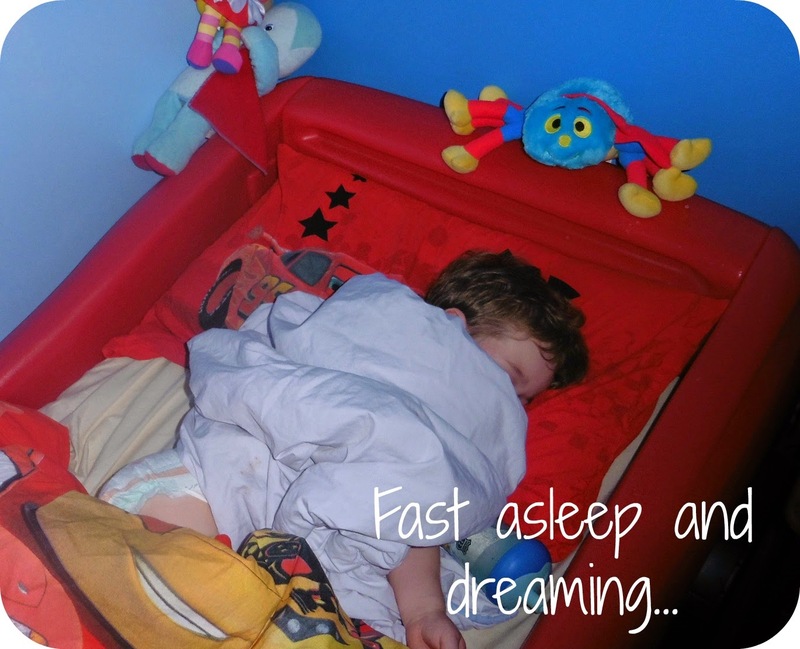 Naps are a give in and we put Leo in a nappy to sleep, and of course when bedtime swings around, nappies are still essential. Leo is now loving wearing pants and will happily pick a pair out when asked, we have come such a long way in such a short space of time, considering 2 weeks ago he wouldn't even contemplate wearing a pair! The other day we popped out to the shops, I wondered if I should risk pants or put a nappy on him. I changed my mind multiple times before deciding to go with the pants. I got Leo to use the potty before we left and I was conscious that we would be some time. He did so, so well all the time we were out. All in all we were out around an hour and Leo stayed dry the entire time, I asked him if he needed to go and he replied 'no'. We got home and I had just got him out of the car, we were just moments to getting in the house and to the potty, when it crept up on him. Leo looked so sad, and his lip wobbled as he plodded into the house. I stripped him down and told him just how well he had done. He had been dry and been such a good boy, and he deserved a sticker for being so clever. This made Leo feel better, and with a new pair of pants we were back on track again. We seem to have nailed the wee's on the potty for the most part now, but poo's are still proving interesting. Each poo until today has not made it into the potty, he has just not shown any interest about getting to the potty in time. But last night he watched a video with a little boy who had just done his very first poo in his potty. He heard how excited the little boy and his Mummy were, and this excited him. He marched right over to his potty and told me he was going to do a poo right there and then. This didn't happen but he has obviously kept this thought in his mind, as today I got a text while I was at work. Granny had text me to tell me that Leo had just done his very first poo on the potty! 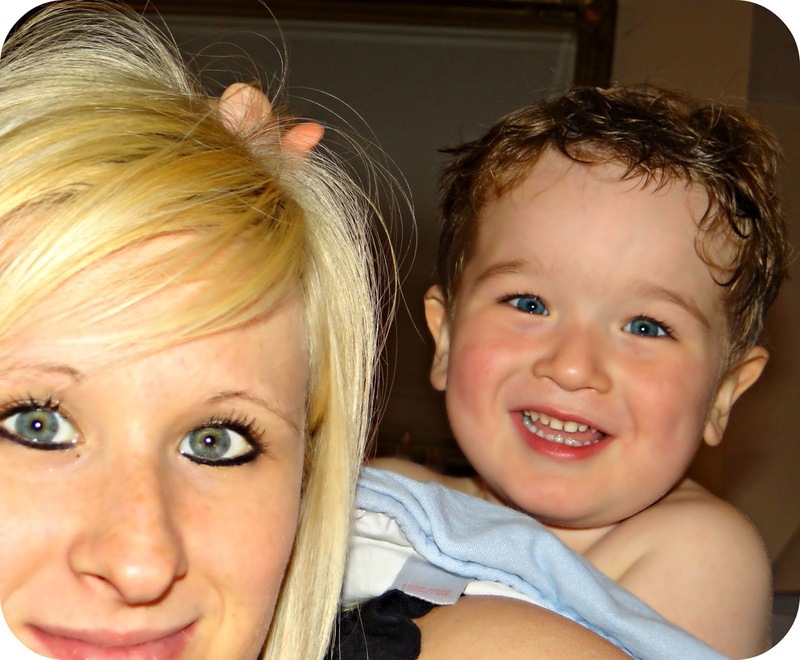 Leo had done so completely of his own accord, Granny was sat in the lounge and the potty was out in the hall. Leo ran into Granny saying 'Mum! Poo in potty!' and when Granny came out to look, she realised he had indeed! Of course lot's of praise was given, and 2 shiny new stickers were added to Leo's bulging sticker chart. We are into out second week of potty training and I think we have made a great start. The days are rolling by and each day Leo is getting more confident. Potty training certainly is a new adventure! 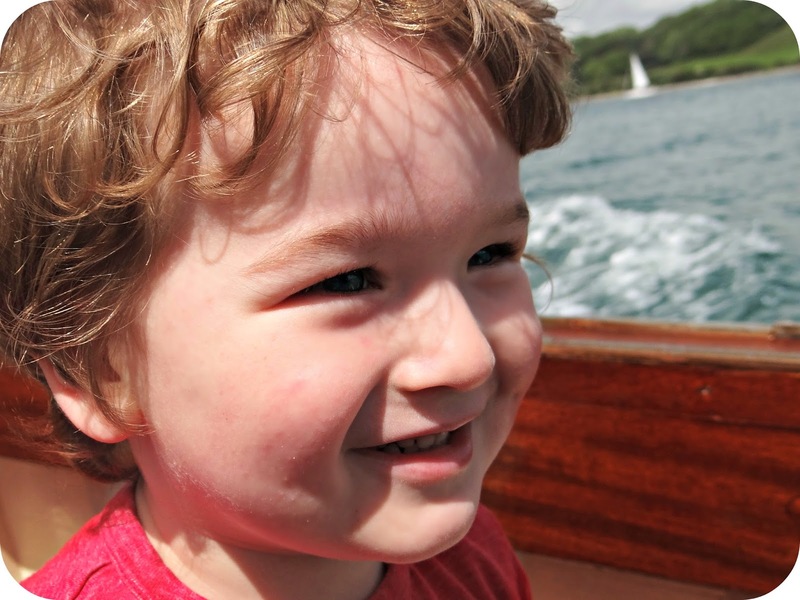 How do you cover childcare for the Summer holidays? Being a working parent, there are bases that I have to cover in order to be able to provide for my family. Of course going out to work means that Leo cannot come with me. It means that I have to have childcare to look after Leo when I cannot. I am really lucky on this front and have my Mum who cares for Leo while I am away at work. This is amazing as Leo is just as much at home at Granny's house as he is at his own. I guess as we lived there for 18 months, he does just accept their home... as our home. In just over a year I will be facing a new dilemma. 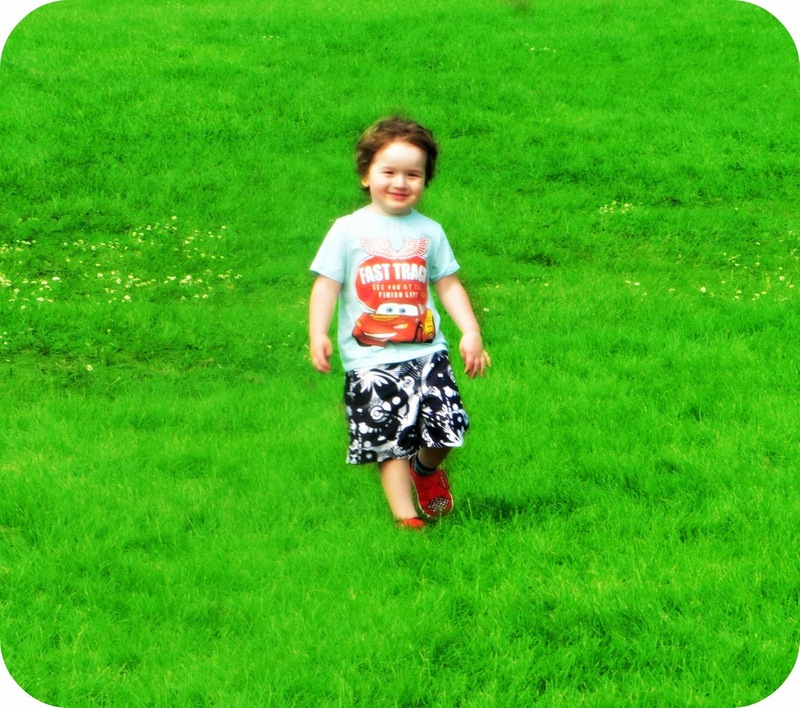 Leo will be starting school and I will have to cover the time that schools aren't open, Summer holidays for instance. Who knows what I will be doing work wise by then? I may still be doing my part time hours, but I could just as easily go back and work full time. I really don't know what my situation will be when the time comes, but there will certainly be days during the holidays that I need to find childcare. It's a topic that anyone with children has to think about at one point or another, but for parents who have to find family or friends to have the kids, or pay for out of school clubs for weeks at a time... It can prove difficult. In a day and age where both Mum and Dad are heading out to work, it makes sense for parent's to put some holiday aside and book some time off for the kid's summer break. After all those summer months are the best times to get out and about as a family. Interestingly though 28% of those booking holiday to look after the children said they would be booking separate weeks to their partner. I can see why this makes perfect sense, as it is something that both Luke and I have done in the past to cover childcare. Booking separate holiday periods allows one of us to always be at home with Leo, and it means that if Granny is away for 2 weeks we can each cover a week at a time. In another area of the results, it highlighted the average age that parents are happy to leave their child un-supervised during the school holidays. This is a point that I think everyone has their own individual opinion on, and I think ultimately it depends on your child and whether they are ready for the extra responsibility. So what is the average age that parent's are happy to leave their children home alone? The average age that parent's are happy to leave their children at home un-supervised is 13 years old. Around the Year 9 mark at school. Do you agree with this age? Would you leave your child home alone at 13? It can be so hard to find the right working/lifestyle balance , I have been trying to perfect it since I stumbled back to the office in 2012. I know that this is going to be a balance I continue to battle for many years to come. What is your plan of action for childcare during the 6 week break?